The invention relates to novel compounds useful as modifying monomers and precursors for polymerization initiators. The invention further relates to a method of making the polymerization initiators and resulting polymers. The invention also relates to polymer compositions comprising the polymer of the invention and further components such as extender oils, fillers, vulcanizing agents etc., and to corresponding vulcanized polymer compositions and articles comprising vulcanized parts made from the vulcanized polymer composition. 本发明涉及可用作阴离子聚合中的改性单体、用作链端部改性剂并且用作用于阴离子聚合中的聚合引发剂的前体的新氨基甲硅烷基取代的二芳基乙烯化合物。  The present invention relates to modified monomer useful anionic polymerization, is used as the chain end modifying agent as used in the polymerization and anionic polymerization initiator in a new silyl carbamoyl precursor agent unsubstituted diarylamino vinyl-based compound. 本发明还涉及使用作为改性单体和/或引发剂前体的所述新化合物制备的聚合物，包括改性(链端部改性的或主链改性的）聚合物，并且涉及由其制成的聚合物组合物。 The present invention further relates to the use as a modifier of the monomers and polymers prepared thereof before a new agent compound / or initiators, including modified (or modified chain ends modified backbone) polymer, and to the the polymer composition made thereof. 本发明另外涉及这些组合物制备硫化组合物和由其制成的物品的用途。 The present invention further relates to the preparation of sulfurized compositions and articles made from these compositions. 聚合物组合物适用于制备硫化组合物并因此适用于制备具有相对低滞后损失、良好抓地力特性和高抗磨损性的交联弹性体组合物。 The polymer composition suitable for preparing sulfurized compositions and thus suitable for the preparation having a relatively low hysteresis loss, good grip properties and high abrasion resistance of the crosslinked elastomeric composition. 此类组合物适用于许多物品，包括具有低生热、低滚动阻力和高抗磨损性与其他希望的物理和化学特性的良好平衡的组合的轮胎面，这些特性例如良好湿抓地力、冰抓地力和抗张强度以及优异可加工性。 Such compositions are suitable for many items, including a low heat, low rolling resistance tire tread and high abrasion resistance with a good balance of other desirable physical and chemical properties of a combination of these properties such as good wet grip, ice grip fertility and excellent in tensile strength and workability. 随着油价增加和需要降低汽车二氧化碳排放的国家立法迫使车胎和橡胶生产者产生"节能型"且因此节约燃料的轮胎。  With the increasing oil prices and national legislation need to reduce carbon dioxide emissions force automobile tires and rubber producers to produce tires, "energy-saving" and thus saving fuel. 获得节能型轮胎的一种常用方式为产生具有减少的滞后损失的轮胎配方。 Obtaining an energy-efficient tires is to produce tire formulations are commonly used way have a reduced hysteresis loss. 在硫化弹性体聚合物中的滞后的主要来源归因于自由聚合物链端部，即在最后交联与聚合物链的端部之间的弹性体聚合物链部分。 The main source of hysteresis in vulcanized elastomeric polymers is attributed to free polymer chain ends, i.e., portions of the elastomeric polymer chain between the last cross-linked with an end portion of the polymer chain. 聚合物的此自由端并不参与有效的弹性可恢复过程并且因此传输至聚合物的此部分的能量丧失。 This polymer does not participate in the free end of the resilient recoverable effective process and thus the energy transmitted to this section of the polymer is lost. 损耗的能量在动态变形下导致显著的滞后。 Results in significant energy loss hysteresis under dynamic deformation. 在硫化弹性体聚合物中的滞后的另一个来源归因于填料颗粒在硫化弹性体聚合物组合物内的不充分分布。 Another source of hysteresis in vulcanized elastomeric polymers is attributed to an insufficient distribution of filler particles in the vulcanized elastomeric polymer composition. 交联弹性体聚合物组合物的滞后损失与其在60 °C下的tan5值相关（参见ISO 4664-1:2005;Rubber,Vulcanized or thermoplastic; Determination of dynamic properties-part 1 ：General guidance) 〇总的来说，在6CTC 下具有相对小的tanS值的硫化弹性体聚合物组合物优选为具有较低滞后损失。 Hysteresis loss of crosslinked elastomeric polymer composition in tan5 values ​​associated therewith at 60 ° C (see ISO 4664-1: 2005; Rubber, Vulcanized or thermoplastic; Determination of dynamic properties-part 1: General guidance) Total square , it has a relatively small value at 6CTC tanS vulcanized elastomeric polymer composition preferably having a relatively low hysteresis loss. 在最终轮胎产品中，这转换成较低滚动阻力和较好的燃料节约。 In the final tire product, this translates to a lower rolling resistance and better fuel economy. 总体上可接受的是较低滚动阻力轮胎以劣化的湿抓地力特征为代价来制成。  Pharmaceutically generally lower rolling resistance of the tire is deteriorated in wet grip characteristics at the cost of steel. 例如，如果在无规溶液苯乙烯-丁二烯橡胶(无规SSBR)中，聚苯乙烯单元浓度相对于总聚丁二烯单元浓度有所减小，并且1，2-聚丁二烯单元浓度保持恒定，那么SSBR玻璃转化温度减小并因此在60°C下的tanS和在〇°C下的tanS也减小，总体上对应于轮胎的提高的滚动阻力和降低的湿抓地力性能。 For example, if the random solution styrene - butadiene rubber (random SSBR), the cell concentration vs. polystyrene-polybutadiene units respect to the total concentration has been reduced, and the 1,2-polybutadiene units concentration was kept constant, SSBR and thus reduce the glass transition temperature and tanS tanS at 60 ° C for at square ° C. is also reduced, to the corresponding increase in overall tire rolling resistance and wet grip performance reduction. 类似地，如果在无规SSBR中，1，2-聚丁二烯单元浓度相对于总聚丁二烯单元浓度有所减小，并且聚苯乙烯单元浓度保持恒定，那么SSBR玻璃转化温度减小并因此在60°C下的tanS和在〇°C下的tanS也减小，总体上对应于轮胎的提高的滚动阻力和降低的湿抓地力性能。 Similarly, if the random SSBR, the concentration of the 1,2-polybutadiene units polybutadiene units respect to the total concentration has been reduced, and a polystyrene unit was kept constant, the glass transition temperature decreases SSBR and thus tanS tanS and at 60 ° C for at square also reduced ° C., generally corresponding to the tire rolling resistance and improved wet grip performance reduction. 因此，当正确评定橡胶硫化性能时，与6 0 °C的tan 5有关的滚动阻力和与〇°C的〖&116有关的湿抓地力应沿着轮胎生热来监测。 Thus, when properly assess the performance of vulcanized rubber, rolling resistance and tan 5 6 0 ° C and an associated 〖square about 116 ° C. & Wet grip should be monitored along the tire heat. Hirao等，Prog • Polym• Sci • 30 (2005) 111 -182描述了多功能聚合物、星形支链聚合物和树枝状支链聚合物的构建。  Hirao et, Prog • Polym • Sci • 30 (2005) 111 -182 describes a multi-purpose polymers, star-branched polymer construct branched polymers and dendrimers. 需要可用于进一步优化含有二氧化硅和炭黑的硫化产品的动力学特征的聚合物(包括改性聚合物），该动力学特征包括低滞后损失和高抗磨损性，这与轮胎中的高湿抓地力、低滚动阻力和高抗磨损性相对应。  The polymer may be required to further optimize the dynamic characteristics of the vulcanized product containing silica and carbon black (including modified polymer), including dynamic characteristics of the low hysteresis loss and high abrasion resistance, with which the tire the humidity grip, low rolling resistance and high wear resistance phase correspond. 另外，需要在热暴露过程中并在机械应力下进一步降低硫化产品的生热。 Further, it is necessary to further reduce the heat and vulcanized product under mechanical stresses during thermal exposure. 这些需要由以下发明来满足。 These need to be met by the following invention. 其中氨基甲硅烷基可键合至两个苯环中的任一个中，多个氨基甲硅烷基可彼此不同，并且R5基团可键合至两个苯环中的任一个中。  wherein amino silyl groups may be bonded to either of the two benzene ring, a plurality of amino silyl groups may be different from each other, and R5 groups may be bonded to any of a two benzene rings. 对于"有机基团"或"烃基基团"指定的碳原子数目并不包括任何任选取代基的那些碳原子数目。 For the "organic group" or "hydrocarbyl group" is the number of carbon atoms does not include the specified number of carbon atoms that any optional substituents. 式1化合物可用作阴离子聚合中的改性单体并且用作聚合引发剂的前体。 Compound  Formula 1 may be used as modifying monomer and anionic polymerization initiator used as the polymerization agent precursor. 其中氨基甲硅烷基可键合至两个苯环中的任一个中，多个氨基甲硅烷基可彼此不同，并且R 5基团可键合至两个苯环中的任一个中。  wherein amino silyl groups may be bonded to either of the two benzene ring, a plurality of amino silyl groups may be different from each other, and R 5 groups may be bonded to either of the two benzene rings in . 对于"有机基团"或"烃基基团"指示的碳原子数目并不包括任何任选取代基的那些碳原子数目。 For the "organic group" or "hydrocarbyl group" indicated number of carbon atoms does not include the number of those carbon atoms optionally substituted with any group. 其中R6和M为本发明第二方面中针对式2所定义的。  The second aspect wherein R6 and M are as defined for formula in the present invention. 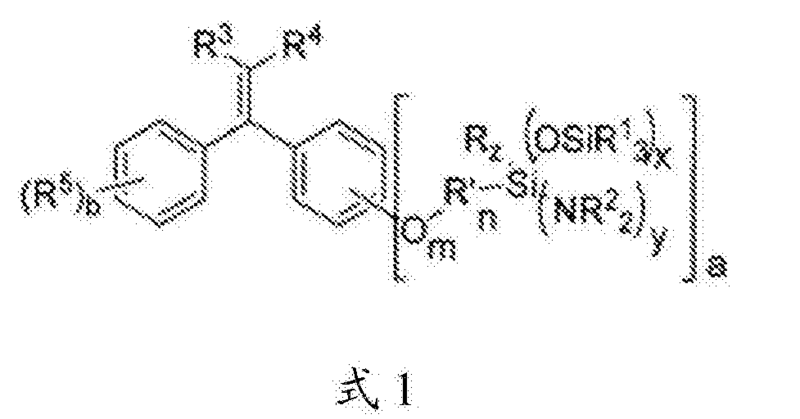 iii，）用作主链改性剂和/或链端部改性剂的式1化合物。  iii,) a compound of formula modifying agent and / or chain end modifying agent 1 used as a backbone. 在第六方面，本发明提供一种第一聚合物组合物，其包含本发明的聚合物(包括改性聚合物)和一种或多种选自以下的另外的组分：（i)添加到用于制备所述聚合物的聚合过程中或者因该聚合过程而形成的组分，以及（ii)在从聚合过程去除溶剂之后保留的组分。  In a sixth aspect, the present invention provides a first polymer composition comprising a polymer according to the present invention (including modified polymer) and one or more additional components selected from :( i) adding to a polymerization process for the preparation of the polymer or due to the components formed by the polymerization process, and (ii) the solvent component after removal from the polymerization process reserved. 添加到聚合过程中的组分包括(尤其是)油(增量油）、稳定剂和其他聚合物。 Component added to the polymerization process comprises (in particular) an oil (extender oil), stabilizers, and other polymers. 在第七方面，本发明提供一种包含本发明的聚合物(包括改性聚合物)和一种或多种填料的第二聚合物组合物。  In a seventh aspect, the present invention provides a polymer comprising the present invention (including modified polymer) and one or more fillers of a second polymeric composition. 该第二聚合物组合物为如从聚合过程中去除溶剂后获得的本发明的聚合物(包括改性聚合物）以及一种或多种填料和其他任选组分的机械搅拌结果。 Polymers of the present invention the second polymer composition after removal of the solvent as obtained from the polymerization process (including the modified polymer) and one or more fillers and mechanical stirring results of other optional components. 第一聚合物组合物和第二聚合物组合物可任选地还包含至少一种硫化剂。  The first polymer composition and second polymer composition may optionally further comprise at least one vulcanizing agent. 在第八方面，本发明提供一种通过将包含至少一种硫化剂的第一聚合物组合物或第二聚合物组合物硫化来获得的硫化聚合物组合物。  In an eighth aspect, the present invention provides a vulcanized polymer composition by vulcanizing agent comprising at least one first polymer or the second polymer composition to obtain the sulfurized compositions. 在第九方面，本发明提供一种制备第七方面的硫化聚合物组合物的方法，其包括将包含至少一种硫化剂的第一聚合物组合物或第二聚合物组合物硫化的步骤。  In a ninth aspect, the present invention provides a method of vulcanizing a polymer composition prepared in the seventh aspect, which comprises a first polymer composition comprising at least one vulcanizing agent or a vulcanization second polymer composition A step of. 在第十方面，本发明提供一种制品，其包括由本发明的硫化聚合物组合物形成的至少一种部件。  In a tenth aspect, the present invention provides an article, comprising at least one component formed from a vulcanized polymer composition of the present invention. 该制品可为例如轮胎、轮胎面、轮胎侧壁、汽车部件、鞋类零件、高尔夫球、皮带、垫圈、密封件或软管。 The article may be, for example, tire tread, tire sidewall, automotive parts, footwear components, golf, belts, gaskets, seals or hose. 根据本发明，发现本发明的式2聚合引发剂能够提供表现出减小的生热、提高的在60°C下的tanS (滚动阻力）和提高的抗磨损性与在用于二氧化硅填充的聚合物组合物中时的低门尼(CML1-4)粘度组合的聚合物诸如SSBR，即对于二氧化硅填充的聚合物组合物而言与聚合物门尼粘度相比仅有少量门尼粘度增加的情况下在低温和高温下的tanS提高的有利平衡。  According to the present invention, it was found according to the present invention of formula 2 to provide a polymerization initiator exhibiting a reduced heat generation, improved TANS (rolling resistance) at 60 ° C for and improved abrasion resistance and used in two low Mooney polymer (CML1-4) when the silica filled polymer composition viscosity of the composition, such as SSBR, i.e., the silica filled polymer compositions in comparison with polymer Mooney viscosity only a case where a small increase in Mooney viscosity is advantageously equilibrated at low and high temperatures tanS improved. 这导致良好的加工特征。 This results in good processing characteristics. 另外，发现式1化合物可用作如本文所述的聚合引发剂的前体、用作共辄二烯和/或芳族乙烯基单体的阴离子聚合中的共聚单体(其中它充当改性单体)并且用作链端部改性剂。 Further, the compound of Formula 1 may be used as a precursor was found as a polymerization initiator as described herein, and as co-Noir diene / vinyl aromatic monomer or anionic polymerization of comonomer (where it acts as a modified monomer) and used as a chain end modifier. 具有1至12个碳原子的有机基团如式1和式2中的R、! ?1和R2所表示的基团为任选地含有一个或多个杂原子(选自N、0和S)并通过碳原子键合的烃基基团。  As an organic group having the formula and in formula 2 R 1 1 to 12 carbon atoms,!? 1 and the group represented by R2 optionally contain one or more heteroatoms (chosen from N, 0 and S) and a hydrocarbyl group bonded through a carbon atom. 具有1至12个碳原子的示例性有机基团和具有1至12个碳原子的示例性烃基基团包括脂族基团和(： 3-&2芳族基团。脂族基团可为直链、支链或环状的并且可为饱和或未饱和的，诸如烷基或烯基。芳族基团可为同素环芳族或杂环芳族。直链脂族基团可为直链(^-& 2脂族基团并且例如为甲基、乙基、正丙基、正丁基、正戊基、正己基、正庚基、正辛基、正壬基、正癸基、正十一烷基和正-十二基、乙烯基、丙烯基以及丁烯基。支链脂族基团可为支链C 3-C12脂族基团并且例如为间丙基、叔丁基、仲丁基、异戊基、新戊基和异己基、异丙烯基和异戊烯基。环状脂族基团可为环状C 3-C12脂族基团并且例如为环丙基、环丁基、环戊基、环己基、环庚基和环辛基、环戊烯基、环己烯基和环庚烯基。同素环芳族基团可为C 6-C12同素环芳族基团并且例如为苯基和奈基。杂环芳族基 Having 1 to 12 carbon atoms, an exemplary organic group, and exemplary hydrocarbon group having 1 to 12 carbon atoms include aliphatic groups and (: 3 & 2 aromatic radicals aliphatic radicals can be straight chain, branched chain or cyclic and may be saturated or unsaturated, such as alkyl or alkenyl. aromatic group may be a homocyclic aromatic or heterocyclic aromatic of straight-chain aliphatic radicals can be straight chain (^ - 2 & aliphatic group and is, for example, methyl, ethyl, n-propyl, n-butyl, n-pentyl, n-hexyl, n-heptyl, n-octyl, n-nonyl, n-decyl, n-undecyl and n - dodecyl, ethenyl, propenyl, butenyl and branched-chain aliphatic group may be a branched C 3-C12 aliphatic group and, for example, inter-propyl, t-butyl, sec-butyl, isopentyl, neopentyl, and isohexyl group, isopropenyl and isopentenyl. a cyclic aliphatic group may be a cyclic C 3-C12 aliphatic group and is, for example, cyclopropyl, cyclobutyl, cyclopentyl, cyclohexyl, cycloheptyl and cyclooctyl, cyclopentenyl, cyclohexenyl and cycloheptenyl. homocyclic aromatic group may be a C 6-C12 aromatic homocyclic aromatic group, for example phenyl and naphthyl and heterocyclic aromatic groups 团可为C3-C12杂环芳族基团并且例如为噻唑基、异噻唑基、噁唑基、异噁唑基、呋喃基、苯硫基、吡嗪基、哒嗪基、嘧啶基、NQ-C7-烷基化或N-三(Q-C7烃基）甲硅烷基保护的吡咯基、吡啶基、苯并噁唑基、苯并噻唑基、苯并呋喃基、噌啉基、酞嗪基、喹喔啉基、 N-&-C7-烷基化或N-三(&-C7烃基）甲硅烷基保护的吲哚基、喹啉基、异喹啉基以及吩嗪基。 Group may be C3-C12 heterocyclic aromatic group and, for example, thiazolyl, isothiazolyl, oxazolyl, isoxazolyl, furanyl, thiophenyl, pyrazinyl, pyridazinyl, pyrimidinyl, NQ -C7- alkyl or N- tris (Q-C7 hydrocarbon) silyl protecting pyrrolyl, pyridyl, benzoxazolyl, benzothiazolyl, benzofuranyl, cinnolinyl, phthalazinyl , quinoxalinyl, N - & - C7- alkyl or N- tris (& -C7 hydrocarbon) silyl-protected indolyl, quinolinyl, isoquinolinyl, and phenazine group. 如本文所定义的有机基团和烃基基团可任选地被一个或多个可取代基取代，该取代基可为相同或不同的。  The organic group and a hydrocarbon group, as defined herein, may optionally be substituted with one or more substituents, the substituent may be the same or different. 有机基团和烃基基团的示例性任选取代基为Ci-C 12烷基、〇5-(：12芳基、C4_C12杂芳基、Q-C6烷氧基、Q-C6烷硫基、二(Q-C6烷基)氨基、二苯基氨基、二(&-C6烷基)膦基、二苯基磷基、〇5-&2芳氧基、C 6-C12芳硫基、三(&-C6烷基）甲硅烷基、三(C6-C12芳基） 甲硅烷基以及三(混合型&-c 6烷基和c6-c12芳基）甲硅烷基。 Exemplary optionally an organic group and a hydrocarbon group substituents are Ci-C 12 alkyl, 〇5 - (: 12 aryl, C4_C12 heteroaryl, Q-C6 alkoxy, Q-C6 alkylthio, two (Q-C6 alkyl) amino, diphenylamino, di (&-C6 alkyl) phosphino group, a diphenylphosphino group, aryloxy group 〇5- & 2, C 6-C12 arylthio, tris ( & -C6 alkyl) silyl, tri (C6-C12 aryl) silyl groups and tris (mixed & -c 6 alkyl and c6-c12 aryl) silyl groups. 本发明的第一方面的化合物为如以上所定义的式1的氨基甲硅烷基取代的二芳基乙烯。  The compounds of the first aspect of the present invention is as above defined formula 1-amino-silyl-substituted diarylethene. 其特征在于烯键与两个苯环进行共辄并一个一个或多个特定的氨基甲硅烷基键合至该两个苯环中的任一个。 And wherein the ethylenically two benzene rings and a co Noir one or more particular amino silyl group bonded to either one of the two benzene ring. 通过将本发明的第一方面的化合物与式3的有机金属化合物R6M反应，可能产生根据本发明的第二方面的式2的化合物(聚合引发剂）。  by reacting a compound of formula with a first aspect of the present invention is an organometallic compound R6M 3 reaction, the compound may produce a second aspect of the present invention of Formula 2 of (polymerization initiator). 在一个实施方案中，每个R独立地选自Q-C6烷基、C2_C6烯基、C7-C 1Q烷基芳基和C6-C1〇芳基，优选地独立地选自&-C4烷基、C7烷基芳基和C 6芳基。  In one embodiment, each R is independently selected from Q-C6 alkyl, C2_C6 alkenyl, C7-C 1Q alkyl C1〇 aryl group and a C6-aryl group, preferably independently selected from & - C4 alkyl, C7 alkylaryl, and C 6 aryl group. 在一个实施方案中，n和m各自为0,即氨基甲硅烷基的Si原子直接键合至苯环。  In one embodiment, n and m are each 0, i.e. a Si atom directly bonded to an amino group bonded to a silyl group of a benzene ring. 在另一个实施方案中，R'为亚甲基，m为0并且n为3,即氨基甲硅烷基的Si原子通过正丙基（-CH 2CH2CH2_)键合至苯环。 In another embodiment, R 'is an alkylene group, m is 0 and n is 3, i.e. the silyl group Si atom of the amino is bonded to the phenyl ring by n-propyl (-CH 2CH2CH2_) key. 在一个实施方案中，每个R1独立地选自CrCn)烷基、C7-C1Q烷基芳基和C 6-C1Q芳基， 优选地独立地选自&-c6烷基和c6-c1Q芳基。  In one embodiment, each R1 is independently selected CrCN) alkyl, C7-C1Q alkyl aryl and C 6-C1Q aryl, preferably independently selected from alkyl and c6- & -c6 c1Q aryl group. 在一个实施方案中，每个R2独立地选自CrCn)烷基、C7-C1Q烷基芳基和C 6-C1Q芳基， 优选地独立地选自&-C8烷基和C7-C8烷基芳基。  In one embodiment, each R2 is independently selected CrCN) alkyl, C7-C1Q alkyl aryl and C 6-C1Q aryl, preferably independently selected from alkyl, and C7- & -C8 C8 alkylaryl group. 在一个实施方案中，R3和R4各自独立地选自氢、甲基和乙烯基并且更优选地二者均为氢。  In one embodiment, R3 and R4 are each independently selected from hydrogen, methyl and vinyl and more preferably both are hydrogen. 在一个实施方案中，每个R5独立地选自直链或支链的&-C5烷基、C7_C 12烷基芳基和〇5_&2基，优选地独立地选自&-C5烷基、C7烷基芳基和C6芳基，更独立地选自&-C5烷基。  In one embodiment, each R5 is independently selected from linear or branched & -C5 alkyl, C7_C 12 alkylaryl, and & 〇5_ 2 group, preferably independently selected from alkyl & -C5 , C7 C6 alkylaryl, and aryl, more independently selected & -C5 alkyl. 式1的氨基甲硅烷基取代的二芳基乙烯化合物在苯环中的一个上含有至少一个氨基甲硅烷基(a多1，y多1)。  Formula 1 amino-substituted silyl group of the vinyl compound containing a diaryl amino group at least one silyl group (a plurality 1, y over) on the benzene ring is a. 在一个优选的实施方案中，a为1。 In a preferred embodiment, a is 1. 在另一个优选的实施方案中，式1化合物并不含有基团R 5 (b = 0)。 In another preferred embodiment, the compound of formula 1 does not contain a group R 5 (b = 0). 连接氨基甲娃烷基和苯环的基团可为单键(m = n = 0)或具有多至12个碳原子的烷基链(R'=亚甲基，m = 0并且n = 1-12)，优选地为单键或正丙基链(即m = n = 0,或者R' =亚甲基并且m = 0且n = 3)。 Carbamoyl group and connected to a benzene ring baby group may be a single bond (m = n = 0) or an alkyl chain having up to 12 carbon atoms (R '= methylene, m = 0 and n = 1 -12), preferably a single bond or n-propyl chain (i.e., m = n = 0, or R '= methylene and m = 0 and n = 3). 在n为至少1的情况下，氨基甲娃烷基取代基从苯环的芳族系统中以电子方式解耦，这可增强在式2化合物中形成的阴离子的稳定性并且可减少氨基甲娃烷基对聚合动力学的影响。 In the case where n is at least 1 alkyl substituent carbamoyl baby electronically decoupled from a benzene ring of the aromatic system, which may enhance the stability of the anion formed in the compounds of Formula 2 and may reduce carbamoyl doll Effect of the alkyl group on the polymerization kinetics. 当m = n = 0时，那么氨基甲娃烷基携带至少一个甲娃烷基氧基(x=l或2)。 When m = n = 0, then the carbamoyl group carrying at least one baby doll alkyl group A (x = l or 2). 在此情况下，优选的是a=l，匕=0^=1或2,7=1或2并且2 = 0或1，并且甚至更优选的是3 = 1或2，& = 0^ = 1，7 = 1并且2 = 1。 In this case, it is preferable that a = l, dagger = 0 or 1 ^ = 2,7 or 2 and 1 = 2 = 0 or 1, and even more preferably 3 = 1 or 2, & = ^ = 0 1,7 = 1 and 1 = 2. 在式1化合物的一个优选实施方案中，每个R独立地选自Q-C5烷基和C6芳基，每个R1独立地选自Q-C4烷基和C6芳基，每个R2独立地选自Q-Cs烷基和C7-C 1Q烷基芳基，R3和R4各自为氢，每个R5独立地选自&-C4烷基，R'为亚甲基，a=l或2，b = 0或l，m = 0，n = 0、l、2S3，x =1或2,7 = 1或2并且2 = 0或1。  In a preferred embodiment of the compounds of Formula 1, each R is independently selected from Q-C5 alkyl, and C6 aryl group, each R1 is independently selected from Q-C4 alkyl, and C6 aryl group, each of R2 is independently selected from Q-Cs-alkyl and C7-C 1Q alkylaryl, R3 and R4 are each hydrogen, each R5 is independently selected & -C4 alkyl, R 'is a methylene group, a = l or 2, b = 0 or l, m = 0, n = 0, l, 2S3, x = 1 or 2 and 2,7 or 2 = 1 = 0 or 1. 本发明的第二方面的聚合引发剂为如以上所定义的式2化合物。  The second aspect of the present invention, the polymerization initiator are as defined above Formula 2 compound. 本发明的聚合引发剂的特征在于键合至两个苯环中的一个或二个的一个或多个特定氨基甲硅烷基并且包含金属原子M。 A polymerization initiator of the present invention wherein two benzene rings bonded to one or more particular amino group or a silyl group and comprises two metal atom M. 碱金属M通常将形成金属阳离子并且抗衡电子（电子对)可在两个苯环上离域。 M is typically an alkali metal cation and the metal counterion will form the electron (electron pair) can be delocalized on both phenyl rings. 在式2引发剂中，1?、1?'、1?1、1?2、1?3、1?4、1? 5、&、13、111、11^、7和2以及其优选实施方案为以上针对式1化合物所定义的。  In the initiators of formula 2, 1?, 1? ', A? 1,1? 2,1? 3,1? 4,1? 5, &, ^ 13,111,11, 2 and 7, and preferred embodiment is a compound as defined above for formula. R6选自Q-C6烷基、苯基和苄基并且优选地选自甲基、正丁基、叔丁基和苯基，更优选地为正丁基。  R6 is selected from Q-C6 alkyl, phenyl and benzyl, and is preferably selected from methyl, n-butyl, t-butyl and phenyl, more preferably n-butyl. M选自锂、钠和钾并且优选地为锂。 M is selected from lithium, sodium and potassium and is preferably lithium. 在式2引发剂的一个优选实施方案中，每个R独立地选自Q-C5烷基和C6芳基，每个R1独立地选自Q-C4烷基和C6芳基，每个R2独立地选自Q-Cs烷基和C7-C 1Q烷基芳基，R3和R4各自为氢，每个R5独立地选自&-C4烷基，R 6选自甲基、乙基、叔丁基、正丁基、仲丁基、苯基以及苄基，M为锂，a = l或2，b = 0或1，m=0并且R'为亚甲基，并且n = l、2或3，x = 0或1，y = l或2并且z = 0或1。  In a preferred embodiment the initiator of Formula 2, each R is independently selected from Q-C5 alkyl, and C6 aryl group, each R1 is independently selected from Q-C4 alkyl, and C6 aryl group, each of R2 is independently selected from a Q-Cs-alkyl and C7-C 1Q alkylaryl, R3 and R4 are each hydrogen, each R5 is independently selected & -C4 alkyl, R 6 is selected from methyl, ethyl, , t-butyl, n-butyl, sec-butyl, phenyl and a benzyl group, m is lithium, a = l or 2, b = 0 or 1, m = 0 and R 'is a methylene group, and n = l , 2, or 3, x = 0 or 1, y = l or 2 and z = 0 or 1. 优选的式2引发剂例如为正丁基锂与以上所示式1化合物的明确实例(化学结构） 的反应产物。  Preferred compounds of formula 2 as a clear example of initiators such as n-butyllithium and the compound represented by the above formula 1 (chemical structure) of the reaction product. 如本发明的第三方面，由含有与两个苯环共辄的烯键的对应式1化合物产生本发明的式2的聚合引发剂。  The third aspect of the present invention, the present invention is to produce 2 converged by the corresponding compound of formula 1 contain two benzene rings co noir ethylenically initiator. [2.2.2]辛烷(DABCO)、N，N' -二甲基哌嗪、四甲基乙二胺(TMEDA)、乙醚、二噁烷、乙二醇二甲醚(甘醇二甲醚(glyme))、二甘醇二甲醚、以及冠醚诸如12-冠醚-4、15冠醚-5和18-冠醚-6。 [2.2.2] octane (DABCO), N, N '- dimethylpiperazine, tetramethylethylenediamine (of TMEDA), diethyl ether, dioxane, ethylene glycol dimethyl ether (glyme (glyme)), diethylene glycol dimethyl ether, and crown ethers such as 12-crown -4,15-crown-5 and 18-crown-6. 该反应通常以式3化合物与式1化合物的比率按照摩尔当量0.5至4 (0.5:1至4:1)、 优选地0.8至1.5并且甚至更优选0.9至1.1进行。  This reaction is usually in a ratio of formula 3 with a compound of formula 1 is 0.5 to 4 molar equivalents (0.5: 1 to 4: 1), preferably 0.8 to 1.5 and even more preferably 0.9 to 1.1. 该反应通常进行2秒至3天的时间段，优选地为5秒至2天，甚至更优选地10秒至10小时，温度范围为-10 °C至130 °C、优选0 °C至100 °C并且甚至更优选20°C至50°C。 The reaction is generally carried out 2 to 3 seconds period, preferably 5-2 seconds, and even more preferably from 10 to 10 seconds, a temperature range of -10 ° C to 130 ° C, preferably 0 ° C to 100 even more preferably ° C and at 20 ° C to 50 ° C.
除式2之外的聚合引发剂可为用于阴离子聚合的任何常规已知的引发剂，例如正丁基锂。  2 other than the formula of a polymerization initiator may be used any conventionally known anionic polymerization initiator, such as n-butyl lithium. 大体上，用于产生本发明的聚合物，可使用一种本发明的聚合引发剂或式1化合物或者本发明的聚合引发剂或式1化合物中的两种或更多种的混合物。  In general, for producing a polymer of the present invention, the present invention may be one kind of polymerization initiator or a compound of the formula or a polymerization initiator of the present invention, two compounds of formula 1 or a mixture or more of . 式2聚合引发剂可与制备所需聚合物所需要的单体总量的一部分反应并且然后可储存一定量的时间，例如从数秒至数周，之后将其进一步与剩余量的单体反应以完成聚合过程。  Formula 2 may be part of a polymerization initiator, the total amount of the reaction monomers and the desired polymer is then prepared and stored a desired amount of time, for example from a few seconds to a few weeks, after which the remaining amount of the single and further body reaction to complete the polymerization process. 在一个实施方案中，单体总量的一部分为基于聚合引发剂的量1至40单体当量。 In one embodiment, a portion of the total amount of the monomers 1 to 40 equivalents based on the amount of monomer of a polymerization initiator. 本发明的聚合物可为末端(链端部)改性的和/或主链改性的改性聚合物。  The polymers of the present invention may be a terminal (chain ends) modified polymer-modified and / or modified backbone. 对于提高主链改性的聚合物，在一种或多种主链改性剂诸如式1化合物存在下进行聚合，该改性剂随着聚合进行而连续或间断地加入。 For improving polymer backbone modification, such as a polymerized compound of formula 1 in the presence of one or more of the main chain modifier, the modifier as the polymerization proceeds continuously or intermittently added. 对于提供链端部改性聚合物，在聚合反应之后加入如下所述且包括式1化合物的一种或多种链端部改性剂。 For providing a modified polymer chain ends is added after the polymerization as described below and comprises one or more chain end modifier compound of formula 1. 据信由链端部改性过程产生的部分作为保护性基团起作用，它防止了聚合物链随后不希望的反应，该链端部改性过程使用具有以下基团的链端部改性剂:末端三烃基甲硅烷基，包括三烷基甲硅烷基、三烷基芳基甲硅烷基和三芳基甲硅烷基;三烃基甲锡烷基，包括三烷基甲锡烷基、三烷基芳基甲锡烷基和三芳基甲锡烷基;二烃基硅烯二基，包括二烷基娃稀二基(dialkylsilendeyl)、二烷基芳基娃稀二基和二芳基娃稀二基；或者二经基锡稀二基，包括二烷基锡烯二基、二烷基芳基锡烯二基和二芳基锡烯二基。  It is produced by partial channel modification process chain ends as a protective group function, it prevents the polymer chains subsequent undesirable reactions, the process uses a modified chain ends having the following chain end groups portion modifier: end trialkylsilyl groups, including trialkylsilyl group, an aryl trialkyl silyl and triaryl silyl group; trihydrocarbyl stannyl group, a trialkyl stannyl group comprising , trialkyl aryl stannyl group and triaryl stannyl group; dialkyl silicon alkenediyl, including baby dilute dialkyl-diyl (dialkylsilendeyl), dialkyl aryl baby lean and diaryl-diyl baby dilute diyl; dilute tin or di-diyl group by including dialkyltin alkenediyl, dialkyl tin alkenediyl aryl and diaryl tin alkenediyl group. 此类保护性基团可通过暴露于含有反应性羟基(-OH)的化合物来去除，所述化合物诸如水、醇、阴离子酸或有机酸(例如，盐酸、硫酸或羧酸）。 Such protecting groups may be removed compound reactive hydroxyl groups (-OH) contained by exposure to the compound, such as water, alcohols, anionic acids or organic acids (e.g., hydrochloric acid, sulfuric acid). 此类条件通常在硫化期间存在。 Such conditions are typically present during vulcanization. 在其中链端部改性剂的末端基团为硫化物连接的情况下，暴露于反应性羟基并脱保护将引起作为聚合物链的末端基团的未保护性硫醇基团（-SH)的形成。 In the case where the terminal group wherein the chain end modifier sulfide connection, is exposed to the reactive hydroxyl and deprotected to cause unprotected thiol groups as terminal groups of the polymer chain (-SH) Formation. 根据用于改性聚合物的工作条件(例如，汽提），可存在未保护的改性聚合物和保护的改性聚合物。 The operating conditions used for the modification of polymers (e.g., stripping), there may be a modified polymer unprotected and protected modified polymers. 据信聚合物的某些末端基团诸如未保护的硫醇基团对于填料诸如二氧化硅和/或炭黑为反应性的，这可引起填料在聚合物组合物内更均匀的分布。  According to some of the terminal groups of the polymer, such as a letter unprotected thiol group to a filler such as silica and / or carbon black reactive, which can lead to a more uniform packing within the polymer composition distributed. 作为链端部改性聚合物的反应产物通常含有总量为聚合物的0.0001至3. OOmmol/ 区、优选地0.0005至1.8111111〇1/〖、更优选地0.0010至1.01]1111〇1/〖并且甚至更优选地0.0020至0.2mmol/g的娃醇基团和烷氧基甲娃烷基。  The reaction product generally contains a modified polymer chain ends the total amount of 0.0001 to 3. OOmmol polymer / region, preferably 0.0005 to 1.8111111〇1 / 〖, more preferably 0.0010 to 1.01] 1111〇1 / 〖and even more preferably 0.0020 to 0.2mmol / g of alcohol groups and the baby doll alkoxysilyl group. 作为链端部改性聚合物的反应产物优选含有总量为聚合物的0.0001至0.80mmol/ g、优选地〇. 0005至0.50mmol/g、更优选地0.0010至0.30mmol/g并且甚至更优选地为聚合物的0.0020至0.20mmol/g的硫化物基团(硫醇基团和/或硫化物连接的保护基团的形式）。  The reaction product as a chain end modified polymer is preferably a polymer containing a total amount of 0.0001 to 0.80mmol / g, preferably square. 0005 to 0.50mmol / g, more preferably 0.0010 to 0.30mmol / g and even more preferably 0.0020 to 0.20mmol g polymer sulfide groups (thiol groups, and / or protecting groups in the form of a sulfide attached) /. 对于大部分应用，本发明的聚合物优选为源自共辄二烯的均聚物、源自两种或更多种共辄二烯或源自共辄二烯和芳族乙烯基单体的共聚物、或一种或两种类型的共辄二烯与一种或两种类型的芳族乙烯基化合物的三聚物。  For most applications, the polymer of the present invention is preferably derived from a co-noir diene homopolymer derived from two or more co-Noir diene or dienes and from co-aromatic vinyl Noir copolymers of the monomers, or one or both types of co-Noir diolefins and one or two types of aromatic vinyl compound trimers. 特别适用的聚合物的实例包括丁二烯或异戊二烯的均聚物和丁二烯、异戊二烯和苯乙烯的无规或嵌段共聚物和三聚物(尤其是丁二烯与异戊二烯的无规共聚物）以及丁二烯与苯乙烯的无规或嵌段共聚物。 Examples of particularly useful polymers include homopolymers of butadiene or isoprene and butadiene, isoprene and random or block copolymers and terpolymers of styrene (especially butadiene and isoprene random copolymers), and random or block copolymers of butadiene and styrene. 尽管不存在关于用于聚合物中的芳族乙烯基单体的量的特定限制，对于大部分应用，芳族乙烯基单体构成基于聚合物总量的1重量％至60重量％、优选2重量％至55重量％ 并且更优选5重量％至50重量％。  While particular limitation on the amount of the aromatic vinyl monomer in the polymer is not present for, for most applications, the aromatic vinyl monomer constituting the polymer based on the total amount of 1 wt% to 60 wt% preferably 2 wt% to 55 wt% and more preferably 5 wt% to 50 wt%. 小于2重量％的量可导致滚动阻力、抗湿滑性和抗磨损性的不利平衡并且导致抗张强度减小，而超过60重量％的量可导致滞后损失增加。 Less than 2% by weight may result in rolling resistance, wet skid resistance and abrasion resistance and results in adverse balance tensile strength decreases, and the amount exceeding 60 wt% may lead to increased hysteresis loss. 聚合物可为芳族乙烯基单体的嵌段或无规共聚物，并且优选地40重量％或更多芳族乙烯基单体单元为单链连接，10重量％或更少单体单元为连续连接的八个或更多个芳族乙烯基单体的聚合"嵌段物"（连续连接的芳族乙烯基单元的长度可通过Tanaka等(Polymer，第22卷，第1721-1723页（1981)研发的臭氧分解-凝胶渗透色谱法来测量）。此范围之外的共聚物倾向于表现出增加的滞后损失。 Polymer may be a block of an aromatic vinyl monomer or a random copolymer, and preferably 40 wt% or more of aromatic vinyl monomer units is connected to a single chain, 10 wt% or less of monomer units eight or more polymerizable vinyl aromatic monomers continuously connected "block objects" (the length of aromatic vinyl units continuously connected by Tanaka et al (Polymer, Vol. 22, pages 1721-1723 ( 1981) developed by ozonolysis - measured by gel permeation chromatography) copolymers outside of this range tend to exhibit increased hysteresis loss. 尽管不存在关于聚合物的共辄二烯部分的1，2_键合/或3,4_键的含量(下文中称为"乙烯键含量"）的特定限制，对于大部分应用，乙烯基含量为小于90重量％，尤其优选小于8〇重量％ (基于聚合物的总量）。  Although on co Noir diene portion of the polymer-bonded 1,2_ / or the content of the specific restriction (hereinafter referred to as "vinyl bond content") is 3,4_ key does not exist, for most applications , a vinyl content of less than 90% by weight, particularly preferably less than 8〇 wt% (based on the total polymer). 如果聚合物中的乙烯基含量超过90重量％，则所得产物可表现出劣化的抗张强度和抗磨损性以及相对大的滞后损失。 If the vinyl content of the polymer exceeds 90% by weight, the resulting product may exhibit a deteriorated tensile strength and abrasion resistance, and relatively large hysteresis loss. 用于制备本发明的聚合物的单体为选自共辄二烯的一种或多种可聚合单体和任选地选自芳族乙烯基化合物的一种或多种可聚合单体。  monomers used to prepare polymers of the present invention is a diene selected co noir one or more polymerizable monomers and, optionally, an aromatic vinyl compound is selected from one or more polymerizable monomer. 另外地且任选地，可使用一种或多种共聚单体。 Additionally and optionally, using one or more comonomers. 适合的共辄二烯包括共辄二烯，诸如1，3-丁二烯、2-烷基-1，3-丁二烯、异戊二烯(2-甲基-1,3-丁二稀）、2,3-二甲基-1,3-丁二烯、1，3_戊二烯、2，4_己二烯、1，3_己二烯、1， 3_庚二烯、1，3_辛二烯、2-甲基-2，4_戊二烯、环戊二烯、2，4_己二烯以及1，3环辛二烯以及其两种或更多种的组合。  Suitable dienes include co co Noir Noir dienes, such as 1,3-butadiene, 2-alkyl-1,3-butadiene, isoprene (2-methyl-1,3 - butadiene), 2,3-dimethyl-1,3-butadiene, 1,3_ pentadiene, hexadiene 2,4_, 1,3_-hexadiene, 1, 3_ heptadiene, 1,3_-octadiene, 2-methyl -2,4_ pentadiene, cyclopentadiene, hexadiene and 2,4_ 1,3-cyclooctadiene, and of two or more thereof. 1，3-丁二烯和异戊二烯为优选的共辄二烯，并且1，3-丁二烯为特别优选的共辄二烯。 1,3-butadiene and isoprene are preferred dienes co Noir, and 1,3-butadiene are particularly preferred diene co Noir. 适合的芳族乙烯基化合物包括苯乙烯、Q-4烷基取代的苯乙烯，诸如2-甲基苯乙烯、3-甲基苯乙烯、4-甲基苯乙烯、2,4_二甲基苯乙烯、2,4,6_三甲基苯乙烯、a-甲基苯乙烯和芪、2,4_二异丙基苯乙烯、4-叔丁基苯乙烯、乙烯基苄基二甲胺、（4-乙烯基苄基）二甲基氨基乙基醚、N，N-二甲基氨基乙基苯乙烯、叔丁氧基苯乙烯、乙烯基吡啶以及式1化合物以及两种或更多种芳族乙烯基化合物的组合。  Suitable aromatic vinyl compounds include styrene, Q-4 alkyl-substituted styrenes, such as 2-methylstyrene, 3-methylstyrene, 4-methylstyrene, 2,4_ dimethyl styrene, trimethyl styrene 2,4,6_, A- methylstyrene and stilbene, 2,4_-diisopropylstyrene, 4-tert-butylstyrene, vinyl benzyl dimethylamine, (4-vinylbenzyl) dimethyl aminoethyl ether, N, N- dimethylaminoethyl styrene, tert-butoxystyrene, vinylpyridine, and the compound of formula 1 as well as two or a combination of an aromatic vinyl compound more. 苯乙烯为特别优选的芳族乙烯基化合物。 Styrene is particularly preferred aromatic vinyl compound. 除以上提及的共辄二烯和芳族乙烯基化合物之外，可以利用选自烯烃和非共辄二烯的一种或多种共聚单体，诸如C2-C 2Qa-烯烃和非共辄C4-C2Q二烯，尤其为降冰片二烯、亚乙基降冰片烯、1，4_己二烯、1，5_己二烯、1，7_辛二烯、4-乙烯基环己烯和二乙烯基苯(包括1， 2-二乙烯基苯、1，3_二乙烯基苯和1，4_二乙烯基苯）。  In addition to the above-mentioned co Noir diene and aromatic vinyl compound, with one or more comonomers chosen from olefins and non-conjugated diene Noir, such as olefins and C2-C 2Qa- C4-C2Q Noir nonconjugated diene, especially norbornadiene, ethylidene norbornene, hexadiene 1,4_, 1,5_-hexadiene, 1,7_-octadiene, 4-vinyl cyclohexene and divinylbenzene (including 1,2-divinylbenzene, 1,3_ 1,4_ divinylbenzene and divinyl benzene). 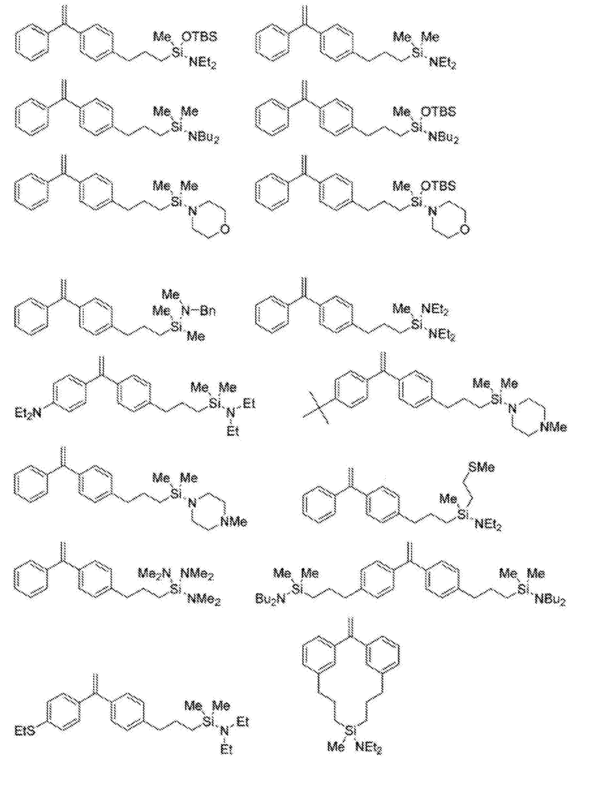 二乙烯基苯尤其将用作支化剂。 In particular, divinyl benzene will be used as branching agents. 另外， 出于聚合物主链改性目的，一种或多种式1化合物可用作共聚单体。 Further, for the purpose of modifying the polymer backbone, one or more compounds of Formula 1 may be used as comonomers. 在一个实施方案中，二乙基苯的量为lmol%或更小（基于用于制备聚合物的单体的总摩尔量），该二乙烯苯包括1，2_二乙烯苯、1，3_二乙烯苯和1，4_二乙烯苯。  In one embodiment, the amount of diethylbenzene was lmol% or less (based on the monomers used to prepare the total molar amount of the polymer), which comprises 1,2_ divinylbenzene divinylbenzene, 1,3_ 1,4_ divinylbenzene and divinyl benzene. 在另一个实施方案中，式1化合物的量为5mol%或更小，优选小于lmol%。 In another embodiment, the amount of the compound of Formula 1 is 5mol% or less, preferably less than lmol%. -种或多种链端部改性剂可用于本发明的聚合反应中，以通过与本发明的聚合物中的聚合物链的末端反应来进一步控制聚合物特征。  - one or more chain end modifier may be used in the polymerization reaction of the present invention in order to further control the polymer wherein the polymer chain end of the polymer by the present invention in the reaction. 通常，硅烷_硫化物《链端部改性剂可用于此目的，该改性剂诸如TO 2007/047943、W0 2009/148932、US 6,229,036、US 2013/ 0131263和EP 2 085 419中所公开的，每份专利以引用的方式整体并入本文。 Typically, the silane sulfide _ 'end of the chain modifier used for this purpose, such as the modifier TO 2007/047943, W0 2009/148932, US 6,229,036, US 2013/0131263 and EP 2 085 419 as disclosed, each patent is incorporated by reference in its entirety herein. 适用于本发明的其他链端部改性剂为W0 2014/040640中所公开的那些以及W0 2014/040639中所描述的硅烷硫化物改性剂。 Useful in the present invention are the other chain end modifying agent as disclosed in W0 2014/040640 silane-sulfide modifier, as well as those described in W0 2014/040639. 另外，根据本发明，还可以利用一种或多种式1化合物作为链端部改性剂。 Further, according to the present invention, it can also use one or more compounds of Formula 1 as a chain end modifier. 链端部改性剂可在聚合期间间断地（以规则或不规则间隔）或连续地加入，但是优选地以超过80%的聚合转化率并且更优选以超过90%转化率加入。  the chain end modifying agent may be intermittently during the polymerization (at regular or irregular intervals) or continuously, but preferably more than 80% of polymerization conversion, and more preferably over 90% conversion was added. 优选地，大量聚合物链端部在与该链端部改性剂反应之前未封端；即，存在活性聚合物链端部并且该链端部能够与改性剂反应。 Preferably, a large number of polymer chain ends prior to reaction with the chain end modifying agent uncapped portion; i.e., the presence of living polymer chain ends and that chain ends can react with a modifying agent. 本领域通常已知的无规化剂（也称为极性配位体化合物）可任选地加入到单体混合物或聚合反应物中，以便调整聚合物的共辄二烯部分的微结构（即，乙烯基键的含量），或者以便调整任何芳族乙烯基单体和乙烯基键在聚合物链内的组成分布。  commonly known in the art randomizing agent (also referred to as polar ligand compounds) may optionally be added to the monomer mixture or the polymerization reaction in order to adjust the total Noir diene polymer portion microstructure (i.e., the content of vinyl bond), or in order to adjust any aromatic vinyl monomer and a vinyl bond composition distribution in the polymer chain. 可使用两种或更多种无规化剂化合物的组合。 You may be used in combination of two or more of the randomizer compounds. 适用于本发明中的无规化剂化合物通常例如为路易斯碱化合物。 Useful in the present invention are generally compounds e.g. randomizer compound is a Lewis base. 用于本发明中的适合路易斯碱例如为诸如以下的醚化合物，诸如二乙醚、二正丁醚、乙二醇二乙醚、乙二醇二丁醚、二乙二醇二甲醚、丙二醇二甲基醚、丙二醇二乙醚、丙二醇二丁醚、（&-C8烷基）四氢呋喃醚(包括甲基四氢呋喃醚、乙基四氢呋喃醚、丙基四氢呋喃醚、丁基四氢呋喃醚、己基四氢呋喃醚以及辛基四氢呋喃醚）、四氢呋喃、2,2-(双四氢化糠基)丙烷、 双四氢化糠基缩甲醛(bistetrahydrofurfurylformal)、四氢糠醇的甲基醚、四氢糠醇的乙基醚、四氢糠醇的丁基醚、甲氧基四氢呋喃、二甲氧基苯和二甲氧基乙烷、以及叔胺诸如三乙胺、吡啶、N，N，N'，N'_四甲基乙二胺、二哌啶乙烷、N，N-二乙基乙醇胺的甲基醚、N，N-二乙基乙醇胺的乙基醚、N，N-二乙基乙醇胺以及二甲基N，N-四氢糠胺。 Suitable Lewis bases in the present invention, for example, ether compounds such as the following, such as diethyl ether, di-n-butyl ether, ethylene glycol diethyl ether, ethylene glycol dibutyl ether, diethylene glycol dimethyl ether, glycol dimethyl ether, propylene glycol diethyl ether, propylene glycol dibutyl ether, (& - C8 alkyl) ether, tetrahydrofuran (THF comprising methyl ether, tetrahydrofuran, ethyl ether, tetrahydrofuran, propyl ether, tetrahydrofuran, butyl ether, octyl hexyl ether, and tetrahydrofuran, tetrahydrofuran ether), tetrahydrofuran, 2,2- (bis tetrahydrofurfuryl) propane, bis tetrahydrofurfuryl formal (bistetrahydrofurfurylformal), methyl ether of tetrahydrofurfuryl alcohol, ethyl ether of tetrahydrofurfuryl alcohol, tetrahydrofurfuryl alcohol Ding ether, tetrahydrofuran methoxy, dimethoxybenzene and dimethoxyethane, and tertiary amines such as triethylamine, pyridine, N, N, N ', N'_ tetramethylethylenediamine, bis piperazine pyridine ethane, N, N- diethylethanolamine methyl ether, N, N- diethylethanolamine ether, N, N- dimethyl-diethylethanolamine, and N, N- tetrahydrofurfurylamine . Na和K乙醇化物可被添加来增加反应率。 Na and K alcoholates may be added to increase the reaction rate. 优选的无规化剂化合物的实例在W0 2009/148932中确定，该专利以引用的方式整体并入本文。 Preferred examples randomizer compound is determined in W0 2009/148932, the entirety of this patent is incorporated herein by reference. 无规化剂化合物通常将以无规化剂化合物与引发剂化合物0.012:1 至10:1、优选0.1:1至8:1且更优选0.25:1至约6:1的摩尔比率添加。 Randomizer compound will typically be randomizer compound and initiator compound of 0.012: 1 to 10: 1, preferably 0.1: 1 to 8: 1 and more preferably from 0.25: 1 to about 6: 1 molar ratio was added. 为了进一步控制聚合物分子量和聚合物特征，可使用偶联剂（"连接剂"）作为本发明的过程中的任选组分。  To further control polymer molecular weight and polymer characteristics, may be used coupling agent ( "linker") as an optional component in the process of the present invention. 与相同分子量的未偶联的基本上线性的聚合物大分子相比，偶联剂将通过减少弹性体聚合物的自由链端部的数目来减小滞后损失并且/或者减小聚合物溶液粘度。 Compared to a substantially linear polymer of the same molecular weight macromolecules uncoupled, the coupling will be reduced by decreasing the hysteresis loss and the number of free chain ends of elastomeric polymers / or reducing the viscosity of polymer solution . 偶联剂诸如四氯化锡可使聚合物链端部官能化并且与弹性体组合物的组分反应， 例如与填料或与聚合物的未饱和部分反应。 Coupling agents such as tin tetrachloride enable polymer chain end and react with the functionalized elastomer composition components such as the reaction with the filler or with unsaturated portions of the polymer. 示例性偶联剂描述于US 3，281，383、US 3， 244,664和1].5.3,692,874(例如，四氯硅烧）；1].5.3,978，103、1].5.4,048,206、4,474,908以及US 6，777，569 (封端的巯基硅烧）；US 3，078，254 (多卤素取代的烃，诸如1，3，5-三(溴甲基）苯）；US 4，616，069 (锡化合物和有机氨基或胺化合物）；以及US 2005/0124740。 Exemplary coupling agents are described in US 3,281,383, US 3, 244,664 and 1] .5.3,692,874 (e.g., tetrachloro silicon burning); 1] .5.3,978,103,1] .5.4,048,206, 4,474,908 and US 6,777,569 (blocked mercapto silicon burning); US 3,078,254 (a multi-halogen-substituted hydrocarbons, such as 1,3,5-tris (bromomethyl) benzene); US 4,616, 069 (tin compound and organic amino or amine compound); and US 2005/0124740. 通常，链端部改性剂在偶联剂添加之前、期间或之后添加，并且改性反应优选在偶联剂添加之后进行。 Typically, the chain end modifying agent prior to addition of the coupling agent, during or after the addition, and modification reaction is preferably carried out after the coupling agent is added. 所使用的偶联剂的总量将影响偶联聚合物的门尼粘度并且该总量的范围通常为每100克弹性体聚合物0.001至4.5微当量，例如每100克聚合物0.01至约1.5微当量。 The total amount of coupling agent used will affect the coupled polymer and a Mooney viscosity range of the total amount of usually elastomeric polymer per 100 grams of 0.001 to 4.5 micro-equivalents, per 100 grams of polymer, for example, about 0.01 to 1.5 MEQ. 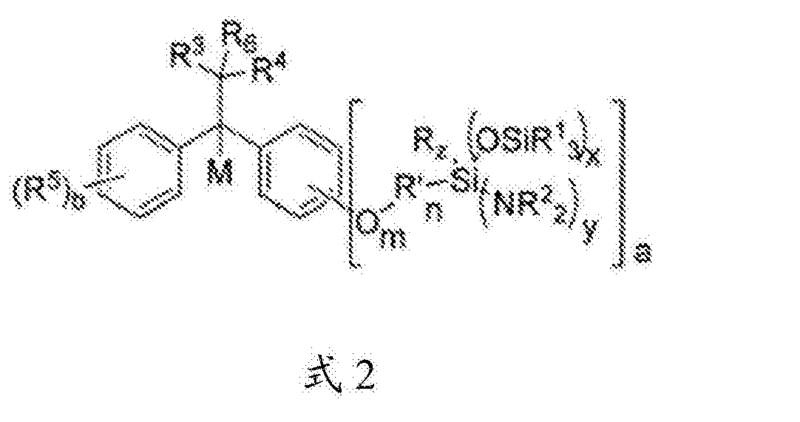 iii '）用作主链改性剂和/或链端部改性剂的式1化合物。  iii ') modifier and / or a compound used as a backbone chain ends Formula 1 modifier. 进一步将所述阴离子活性聚合物与如上所述的链端部改性剂反应，因此形成链端部改性聚合物。  Further to the above anionic living polymer chain ends with a modifying agent, thus forming a modified polymer chain ends. 制备聚合物的方法通常在聚合溶剂中作为溶液聚合来进行，其中所形成的聚合物基本上可溶于反应混合物中，或者作为悬浮聚合/淤浆聚合来进行，其中所形成的聚合物基本上不溶于反应介质中。 Preparation Method  polymers typically be carried out as a solution polymerization in a polymerization solvent, wherein the polymer formed is substantially soluble in the reaction mixture or as a suspension polymerization / slurry polymerization carried out, the polymerization formed therein It was substantially insoluble in the reaction medium. 适合的聚合溶剂包括非极性脂族溶剂和非极性芳族溶剂，优选己烷、庚烷、丁烷、戊烷、isopar、环己烷、甲苯以及苯。 Suitable polymerization solvents include non-polar aliphatic solvent and a nonpolar aromatic solvent, preferably hexane, heptane, butane, pentane, Isopar, cyclohexane, toluene and benzene. 溶液聚合正常发生在较低压力下，优选地低于lOMPa，优选地在0°C至120°C的温度范围内。 Solution polymerization normally occur at lower pressures, preferably below Lompa, preferably within a temperature range of 0 ° C to to 120 ° C. 该聚合通常在分批的聚合条件、连续的聚合条件或半连续的聚合条件下进行。 The polymerization conditions in the polymerization is generally a batch, continuous or semi-continuous polymerization conditions of polymerization conditions. 通常，关于聚合技术的适用信息包括聚合引发剂化合物;极性配位体化合物和促进剂，各自增加引发剂的反应性、无规地排列芳族乙烯基化合物、无规地排列引入在聚合物中的1，2-聚丁二烯或1，2-聚异戊二烯或3，4-聚异戊二烯单元;每种化合物的量;单体；以及适合的方法条件，这些信息描述于W0 2009/148932,该专利以引用的方式全部并入本文。  Generally, suitable polymerization techniques include information about a polymerization initiator compound; polar ligand compound and promoter, each increase the reactivity of the initiator, random arrangement of aromatic vinyl compound be, introduced randomly arranged 1,2-polybutadiene or 1,2-polyisoprene or 3,4-polyisoprene units in the polymer; the amount of each compound; monomer; and a suitable process conditions, the information described in W0 2009/148932, which patent is incorporated herein by reference in its entirety. 根据本发明的第一聚合物组合物包含本发明的聚合物(包括改性聚合物)和一种或多种选自以下的另外的组分：（i)添加到用于制备所述聚合物的聚合过程中或者因所述聚合过程而形成的组分，以及（ii)在从聚合过程去除溶剂之后保留的组分。  and one or more additional components selected from a first polymer composition according to the present invention comprises a polymer of the invention (including modified polymer): (i) added to the preparation for said polymerization process because the polymer components of the polymerization process or formed, and (ii) the solvent component after removal from the polymerization process reserved. 通常，该第一聚合物组合物为制备该聚合物的方法的无溶剂结果，其还包含选自油(增量油）、稳定剂和其他(非发明性)聚合物。 Typically, the first polymer of the polymer composition is a method for preparing solvent-free results, which further comprises an oil selected from (extender oil), stabilizers, and other (non-inventive) polymer. 适合的油为如本文所定义的。 Suitable oils as defined herein for. 其他聚合物可在溶液中单独地制备，例如在不同聚合反应器中，并且可在聚合物的聚合物制造过程完成之前添加到反应器中。 Other polymers may be separately prepared in solution, for example in a different polymerization reactor, and the reactor may be added to the polymer before the polymer manufacturing process is completed. 在第一组合物中，所存在的聚合物优选地由至少15重量％的如聚合反应中所获得的聚合物、更优选至少30重量％以及甚至更优选至少45重量％组成。 Polymer  In the first composition, the polymer is preferably present in from at least 15 wt% as obtained by polymerization, more preferably at least 30 wt% and even more preferably at least 45% by weight of the composition. 剩余量的聚合物由以上所提及的其他聚合物组成。 The remaining amount of the polymer by the above-mentioned other polymers. 适合聚合物的实例在W0 2009/148932中确定并且优选包括苯乙烯-丁二烯共聚物、天然橡胶、聚异戊二烯和聚丁二烯。 Examples of suitable polymers are determined in W0 2009/148932 and preferably include styrene - butadiene copolymer, natural rubber, polyisoprene and polybutadiene. 希望的是此类其他聚合物具有范围为20至150、优选30至100的门尼粘度(ML 1+4,100°C，如根据ASTM D 1646 (2004)所测量的)）。 Such other desirable polymers having a range of 20 to 150, preferably 30 to 100 Mooney viscosity of (ML 1 + 4,100 ° C, such as in accordance with ASTM D 1646 (2004) measured)). 根据本发明的第七方面的第二聚合物组合物包含本发明的聚合物(包括改性聚合物)和一种或多种填料。  According to a seventh aspect of the polymer composition of the invention the second polymer comprising the present invention (including modified polymer) and one or more fillers. 第二聚合物组合物通常为涉及本发明的聚合物和一种或多种填料的机械混合过程的结果。 The second polymer is generally directed to a polymer composition of the present invention and one or more fillers the mechanical mixing process the results. 它通常包含添加到该聚合物或第一聚合物组合物中并且与该聚合物或组合物机械混合的组分。 It usually contains added to the polymer or the first polymer composition and the components are mixed with the polymer or composition machine. 第一聚合物组合物和第二聚合物组合物可任选地还包含至少一种如以下进一步定义的硫化剂。  The first polymer composition and second polymer composition may optionally further comprise at least one vulcanizing agent as defined further below. 包含填料的第二聚合物组合物可通过在捏和机中在140 °C至180°C下捏和所述第一聚合物组合物和一种或多种填料来制备，该第一聚合物组合物任选地包含一种或多种选自油、稳定剂和其他聚合物的组分。  The filler comprises a second polymer composition can be prepared by first kneading the polymer composition and one or more fillers at 140 ° C to 180 ° C in a kneader, the first a polymer composition optionally comprises one or more components selected from oils, stabilizers and other polymers. 可选地，第二聚合物组合物可通过在捏和机中在140°C至180°C下捏和第一聚合物组合物和一种或多种填料来制备，以形成"第一阶段"第二组合物。  Alternatively, the second polymer composition can be prepared by kneading a first polymer composition and one or more fillers at 140 ° C to 180 ° C in a kneader, to form a " The first phase "second composition. "第一阶段"第二组合物的形成可涉及一个或多个混合步骤，优选地2至7个混合步骤。 Forming the "first phase" of the second composition may involve one or more mixing steps, preferably 2-7 mixing step. 在冷却后，将硫化剂诸如硫、 硫化促进剂、任选地氧化锌等加入到"第一阶段"第二组合物中，并且使用与Banbury或互相啮合转子或开放式辊乳机相关的密炼机将所得"第二阶段"第二组合物共混。 After cooling, vulcanizing agents such as sulfur, vulcanization accelerators, zinc oxide and the like are optionally added to the "first stage" second composition, and the use of secret associated with Banbury rotors or intermeshing milk machine, or an open roll mill the resulting composition is blended with a second "second stage." [0M4] -种或多种油(包括液体聚合物)可与未交联聚合物组合使用以减小粘度或门尼值或者以提高第一聚合物组合物的可加工性和(硫化)第二聚合物组合物的各种性能特征。 [0M4] - one or more oils (including liquid polymers) may be used in combination with a non-crosslinked polymer in order to reduce viscosity or Mooney values, or the first polymer composition to improve the processability and (vulcanization) of various performance characteristics of two polymer compositions. 油和液体聚合物可在聚合物制备过程之前添加到聚合物中并且作为根据本教导的第一聚合物组合物或第二聚合物组合物制备过程中的单独组分。  polymer and liquid oil may be added during preparation of the polymer prior to the polymer and is prepared as a separate component of the present teachings first polymer composition or the second polymer composition in accordance with the process. 对于油的代表性实例和分类，参见WO 2009/148932和US 2005/0159513,每个专利以引用的方式整体并入本文。 Representative examples of oil and for classification, see WO 2009/148932 and US 2005/0159513, each patent is incorporated by reference herein in its entirety. 对于液体聚合物，参见US 8030406 B2和US7868081 B2中的实例。 For the liquid polymers, see US 8030406 B2, and examples of US7868081 B2. 示例性油包括例如常规已知的增量油，诸如芳族、环烷和石蜡增量油，例如MES (轻度提取的溶剂化物）、TDAE (处理的蒸馏物芳族提取物）、橡胶制液体(rubber-to_liquid，RTL)油、生物质制液体(biomass-to-liquid，BTL)油、油膏、增量树脂或具有500至20000g/mol平均分子量(根据BS ISO 11344: 2004通过GPC测定）的液体聚合物(诸如液体BR)。 Exemplary oils include, for example, conventionally known extender oils, such as aromatic, naphthenic and paraffinic extender oils, such as MES (mild extraction solvate), TDAE (distillate aromatic extract treated), rubber liquid (rubber-to_liquid, RTL) oil, liquid biomass (biomass-to-liquid, BTL) of oil, grease, or a resin having a 500 to increment 20000g / mol average molecular weight (11344 BS ISO according to: 2004 measured by GPC ) of the liquid polymer (such as a liquid BR). 另外，天然油(包括植物油)可用作增量油。 In addition, natural oils (including vegetable oils) may be used as extender oil. 代表性油还包括这些油的官能化变形，尤其是环氧化油或羟基化油。 Representative oils include functionalized further modification of these oils, especially hydroxylated epoxidized oil or oil. 该油可含有不同浓度的聚环芳族化合物、石蜡、环烷烃和芳族物并且可具有不同的玻璃转化温度。 The polycyclic aromatic compound may contain different concentrations of oil, paraffins, naphthenes, and aromatics, and may have different glass transition temperatures. 聚合物组合物可含有总量为0至70phr、优选0.1至60phr、更优选0.1至50phr的一种或多种油。  The polymer composition may contain a total amount of 0 to 70 phr, preferably from 0.1 to 60 phr, more preferably from 0.1 to 50phr one or more oils. 当液体聚合物用作本发明的聚合物组合物中的增量油时，当计算聚合物基质的组成时它们并不考虑在内。 When extender oil is used as the polymer of the present invention, the liquid polymer compositions, when calculating the composition of the polymer matrix are not taken into account. ⑶用于高活性白色填料的分散剂，包括Struktol W33和WB42。  ⑶ high activity for the white filler dispersant comprising Struktol W33 and WB42. 本发明的第二组合物包含用作增强剂的一种或多种填料。  The second composition of the invention comprises one or more fillers as reinforcing agents. 适合的填料的实例包括炭黑(包括导电炭黑）、碳纳米管(CNT)(包括离散的CNT、空心碳纤维(HCF)和改性的CNT，它们携带一种或多种官能团，诸如羟基、羧基和羰基）、石墨、石墨烯（包括离散的石墨烯小片）、二氧化硅、碳-二氧化硅双相填料、粘土(分层的硅酸盐，包括剥落的纳米粘土和有机粘土）、碳酸钙、碳酸镁、木质素、无定形填料诸如基于玻璃颗粒的填料、基于淀粉的填料、以及其组合。 Examples of suitable fillers include carbon black (including conductive carbon black), carbon nanotubes (the CNT) (the CNT comprising a discrete, hollow carbon fibers (HCF) and modified the CNT, which carry one or more functional groups, such as hydroxyl, carboxyl group and a carbonyl group), graphite, graphene (graphene comprising discrete platelets), silica, carbon - silica dual phase filler, clay (layered silicates, comprising exfoliated nanoclays and organoclays), calcium carbonate, magnesium carbonate, lignin, an amorphous glass-based fillers such as filler particles, the filler is starch, and combinations thereof based. 适合填料的其他实例描述于W0 2009/148932中，该专利以引用的方式并入本文。 Other examples of suitable fillers are described in W0 2009/148932, which patent is incorporated by reference herein. 适合的炭黑的实例包括通过炉法常规制造的炭黑，例如具有50-200m2/g的氮吸附比表面积和80-200ml/100g的DBP油吸附的炭黑，诸如FEF、HAF、ISAF或SAF类别的炭黑、以及导电炭黑。  Examples of suitable carbon black include carbon black produced by a conventional furnace, for example 50-200m2 / g and a nitrogen adsorption specific surface area DBP oil 80-200ml / 100g adsorbent carbon black, such as FEF, HAF, ISAF or SAF class carbon black, and conductive carbon black. 在一些实施方案中，使用高聚结型炭黑。 In some embodiments, a high coalescing type carbon black. 炭黑通常以每100重量分数的总聚合物2 至100重量分数、或5至100重量分数、或10至100重量分数、或10至95重量分数的量使用。 Carbon black generally used in a weight fraction of 2 to 100 per 100 total polymer weight fraction or weight fraction of 5 to 100, or from 10 to 100 weight fraction, or 10 to 95 by weight fraction. 适合二氧化硅填料的实例包括湿法二氧化硅、干法二氧化硅和合成的硅酸盐型二氧化硅。  Examples of suitable silica fillers include wet silica, dry process silica, and synthetic silicate-type silica. 具有小颗粒直径和高表面积的二氧化硅表现出高增强效应。 Silica having a high surface area and small particle diameter exhibits a high reinforcing effect. 小直径的高聚结型二氧化硅（即具有大表面积和高油吸附性)在聚合物组合物中表现出优异分散性，从而产生优异可加工性。 Coalescing the small diameter high silica (i.e., having a large surface area and high oil absorption property) exhibits excellent dispersibility in the polymer composition, thereby resulting in excellent workability. 关于主要颗粒直径的二氧化硅平均颗粒直径可为5至60nm或10至35nm。 The average particle diameter of the silica primary particle diameter may be about 5 to 10 or 60nm to 35nm. 二氧化硅颗粒的比表面积(通过BET方法测量的）可为35至300m 2/g。 The specific surface area of ​​the silica particles (measured by the BET method) may be 35 to 300m 2 / g. 二氧化硅通常以每100重量分数的总聚合物10至100重量分数、或30至100重量分数、或30至95重量分数的量使用。 Silica is normally used in a weight fraction of 10 to 100 per 100 total polymer weight fraction or weight fraction of 30 to 100, or 30 to 95 by weight fraction. 二氧化硅填料可与其他填料组合使用，该其他填料包括炭黑、碳纳米管、碳-二氧化硅双相填料、石墨烯、石墨、粘土、碳酸钙、碳酸镁以及其组合。  Silica fillers may be used in combination with other fillers, the other fillers include carbon black, carbon nanotubes, carbon - silica dual phase filler, graphene, graphite, clay, calcium carbonate, magnesium carbonate, and combinations thereof. 炭黑和二氧化硅可一起添加，在此情况下炭黑和二氧化硅的总量为每100重量分数的总聚合物30至100重量分数或30至95重量分数。  Carbon black and silica may be added together, in which case the total amount of carbon black and silica to the total polymer weight fraction per 100 weight fractions of from 30 to 100 or 30 to 95 weight fraction. 碳-二氧化硅双相填料为通过将二氧化硅涂覆在炭黑表面上来制备的所谓二氧化硅涂覆的炭黑并且可以商品名CRX2000、CRX2002或CRX2006 (Cabot Co.的产品）商业获得。  Carbon - by silica dual phase filler is so called silica-coated silica-coated onto the surface of the carbon black produced in the carbon black and the trade name CRX2000, CRX2002 or CRX2006 (Cabot Co. of products ) are commercially available. 碳-二氧化硅双相填料以与以上相对于二氧化硅所述的相同量添加。 Carbon - silica dual phase filler in the same amount or more with respect to the silica is added. 在一些实施方案中，将硅烷偶联剂(用于增容聚合物和填料)添加到包含本发明的聚合物和二氧化硅、分层硅酸盐(诸如麦烃硅钠石(magadiite))或碳-二氧化硅双相填料的组合物。  In some embodiments, the silane coupling agent (compatibilizer for polymer and filler) added to the polymer and silica, layered silicates of the present invention comprising (a hydrocarbon such as silica sodalite wheat ( magadiite)) or a carbon - silica dual phase filler composition. 所添加的硅烷偶联剂的典型量为每100重量分数的总量的二氧化硅和/或碳-二氧化硅双相填料约1至约20重量分数，并且在一些实施方案中为约5至约15重量分数。 Typical amounts of added silane coupling agent per 100 weight fraction of the total amount of silica and / or carbon - silica dual phase filler from about 1 to about 20 weight fraction, and in some embodiments from about 5 to about 15 weight fraction. ⑶单官能硅烷，包括Si203 ((EtO) 3-Si-C3H7)和Si208 ((EtO) 3-Si-C8Hi7)。  ⑶ monofunctional silanes include Si203 ((EtO) 3-Si-C3H7), and Si208 ((EtO) 3-Si-C8Hi7). 硅烷偶联剂的其他适合实例在W0 2009/148932中给予并且包括双-(3-羟基-二甲基甲硅烷基-丙基）四硫化物、双-(3-羟基-二甲基甲硅烷基-丙基）二硫化物、双-(2-羟基-二甲基甲硅烷基-乙基）四硫化物、双-(2-羟基-二甲基甲硅烷基-乙基)二硫化物、3-羟基-二甲基甲硅烷基-丙基-N，N-二甲基硫基氨甲酰四硫化物以及3-羟基-二甲基甲硅烷基-丙基苯并噻唑四硫化物。  Other suitable examples of the silane coupling agents given in W0 2009/148932 and include bis - (3-hydroxy - dimethylsilyl-yl -) tetrasulfide, bis - (3-hydroxy - dimethyl silyl - propyl) disulfide, bis - (2-hydroxy - dimethylsilyl-yl - ethyl) tetrasulfide, bis - (2-hydroxy - dimethylsilyl-yl-ethyl) - disulfide, 3-hydroxy - dimethylsilyl group - propyl -N, N- dimethyl carbamoyl group tetrasulfide, and 3-hydroxy - dimethylsilyl group - propyl-benzothiazole tetrasulfide. 常规用于制造橡胶产品的任何硫化剂可用于本发明中并且可使用两种或更多种硫化剂的组合。  Any conventional vulcanizing agent for the manufacture of rubber products and can be used in the present invention may be used in combination of two or more vulcanizing agents. 关于硫化剂的其他实例和另外的信息可见于Kirk-Othmer，Encyclopedia of Chemical technology第3版(Wiley Interscience，NY 1982)，第20卷，第365-468页（确切的说为"Vulcanizing Agents and Auxiliary Materials"第390-402页）。  Other examples and further information regarding vulcanizing agents can be found in Kirk-Othmer, Encyclopedia of Chemical technology 3rd edition (Wiley Interscience, NY 1982), Vol. 20, pp. 365-468 (precisely as "Vulcanizing Agents and Auxiliary Materials "page 390-402). 次磺酰胺（sulfene amide)型、胍型或秋兰姆型的硫化促进剂可按需要与硫化剂一起使用。  sulfenamide (sulfene amide) type, thiuram type or guanidine type vulcanization accelerator can be used together with a vulcanizing agent needs. 可任选地添加其他添加剂，诸如锌白、硫化助剂、防老化剂、加工助剂等。 Other additives may optionally be added, such as zinc white, vulcanization auxiliaries, aging preventives, processing aids and the like. 硫化剂通常以每100重量分数的总聚合物0.5至10重量分数或者在一些实施方案中1至6重量分数的量添加到聚合物组合物中。 Or vulcanizing agent added is usually 0.5 to 10% by weight of the total polymer fraction per 100 weight fractions, in some embodiments, an amount of 1 to 6 weight fraction of the polymer composition. 硫化促进剂的实例及其相对于总聚合物所添加的量在W0 2009/148932 中给出。 Examples of the vulcanization accelerator and the phase is given to the total amount of polymer added in the W0 2009/148932. 硫促进剂系统可含有或不含有氧化锌。  Vulcanization accelerator system may or may not contain zinc oxide. 氧化锌优选用作硫促进剂系统的组分。 Zinc oxide is preferably used as the sulfur promoting agent component system. 根据本发明的第八方面的硫化聚合物组合物通过将包含至少一种硫化剂的第一聚合物组合物或第二聚合物组合物硫化来获得。  According to an eighth aspect of the vulcanized polymer composition of the present invention, by comprising at least a first polymer composition comprising a vulcanizing agent or a vulcanization second polymer composition is obtained. 由于本发明的硫化弹性体聚合物组合物表现出低滚动阻力、低动态生热和优异抗湿滑性能，所以它们良好地适用于制造轮胎、轮胎面、轮胎侧壁和轮胎胎体以及其他工业产品诸如皮带、软管、减震器以及鞋类部件。 Since the vulcanized elastomeric polymer composition of the present invention exhibit low rolling resistance, low dynamic heat and excellent wet skid resistance, they are well suited for the manufacture of tires, tread, tire sidewall and tire carcass and other industrial products such as belts, hoses, dampers, and footwear components. 硫化聚合物组合物为对以下进行的反应性聚合物-聚合物交联形成过程的结果： (i)聚合物与至少一种硫化剂的混合物、（ii)包含至少一种硫化剂的第一聚合物组合物、或(iii)包含至少一种硫化剂的第二聚合物组合物。  vulcanization of the polymer composition for the less reactive polymer - results in the formation of crosslinked polymer: (i) at least a mixture of polymer and vulcanizing agent, (ii) at least one curing agent comprising a first polymer composition, or (iii) a second polymer comprising at least one vulcanizing agent composition. 因此，反应性过程将基本上未交联的聚合物或基本上未交联的聚合物组合物、尤其为各自含有至少一种硫化剂的第一聚合物组合物或第二聚合物组合物转化为硫化(或交联)聚合物组合物。 Thus, the reactive process will substantially uncrosslinked polymer or substantially non-crosslinked polymer composition, in particular a first polymer composition each comprising at least one vulcanizing agent or the second polymer composition into sulfide (or crosslinked) polymer composition. 本发明的交联(硫化)聚合物组合物表现出减小的生热、增加的在60°C下的回弹性和良好的物理特征平衡，该物理特征包括以下一种或多种:抗磨损性、抗张强度、模量和撕裂，而包含未交联聚合物(在硫化之前）的组合物维持良好加工特征。  cross-linking (vulcanization) polymer composition of the present invention exhibit a reduced heat generation, increase the resilience and good physical characteristics at 60 ° C for the balance of the physical characteristic comprises one or more : abrasion resistance, tensile strength, modulus and tear, and comprising a non-crosslinked polymer (prior to vulcanization) maintain good processing composition characteristics. 该组合物适用于制备具有较低滚动阻力和较低生热同时维持良好磨损特征的轮胎面。 The composition is suitable for preparing a tire tread having low rolling resistance and low heat while maintaining good wear characteristics. 对于硫化聚合物，凝胶含量基于聚合物的重量优选大于50重量％，更优选大于75 重量％并且甚至更优选大于90重量％。  For the vulcanized polymer, based on weight of the polymer gel content is preferably greater than 50 wt%, more preferably more than 75 wt% and even more preferably greater than 90 wt%. 凝胶含量可通过在环境温度下将0.2克聚合物溶解在150ml甲苯中持续24小时、分离不溶物、干燥不溶物并且测量不溶物的量来测定。 The gel content can be obtained by at ambient temperature for 0.2 g of polymer is dissolved in 150ml toluene was continued for 24 hours, insoluble matter was separated, dried and the insoluble matter was determined by measuring the amount of insolubles. 本发明还提供一种制品，其包括由本发明的硫化聚合物组合物形成的至少一种部件。  The present invention further provides an article comprising at least one component formed from a vulcanized polymer composition of the present invention. 该制品可为轮胎、轮胎面、轮胎侧壁、汽车部件、鞋类零件、高尔夫球、皮带、垫圈、密封件或软管。 The article may be a tire tread, tire sidewall, automotive parts, footwear components, golf, belts, gaskets, seals or hose. 为了产生车辆轮胎，以下其他聚合物在与本发明的聚合物组合使用中特别有意义：天然轮胎；包含小于20重量％的1，2_聚丁二烯的低顺式聚丁二烯（LCBR)、乳状液SBR (ESBR)和具有超过-50°C的玻璃转化温度的溶液SBR (SSBR)橡胶;具有高顺式-1，4-单元含量的(>90%)的聚丁二烯橡胶，诸如通过使用基于镍、钴、钛、钒、钆或钕的催化剂来获得的； 以及具有〇%至75%的乙烯基含量的聚丁二烯橡胶；以及其组合;具有高反式-1，4-单元含量(>75%)的聚丁二烯橡胶或含有例如5重量％与45重量％之间的苯乙烯且在共聚物聚丁二烯部分中具有高反式-1，4_聚丁二烯含量(>75%)的SBIU每种类型的聚合物SBR或BR可使用一种或多种包含碱土金属化合物的引发剂化合物来获得，诸如美国专利号6,693,160;6， 627,715;6,489,415;6，103,842;5,753,579 ;5,086，136;以及3,629,213中所述的，每个专利以引用的方式  In order to produce vehicle tires, other polymers of particular interest in the use of the polymer composition of the present invention and in which: Natural tire; comprising less than 20% by weight of polybutadiene 1,2_ low cis polybutadiene ene (LCBR), emulsion SBR (of ESBR), and having a -50 ° C solution SBR exceeds the glass transition temperature (of SSBR) rubbers; means having a high cis-1,4 content (> 90%) of butadiene diene rubbers, such as by using a nickel-based, cobalt, titanium, vanadium, neodymium, gadolinium or a catalyst obtained; and a polybutadiene rubber having a vinyl content billion% to 75%; and combinations thereof; with high trans unit-1,4 content (> 75%) or polybutadiene rubber containing styrene, for example, between 5 wt% and 45 wt% of the copolymer and having a high trans polybutadiene-1 section , 4_ polybutadiene content (> 75%) of each type of polymer SBIU SBR or BR or more using an alkaline earth metal compound containing initiator compound is obtained, such as U.S. Patent Nos. 6,693,160; 6, 627,715; 6,489,415; 6,103,842; 5,753,579; 5,086,136; 3,629,213, and in the embodiment, each incorporated by reference in 整体并入本文;或者通过使用基于钴的催化剂来获得，诸如在美国专利号6310152; 5,834,573; 5,753,761; 5,448,002和5,089,574以及美国专利申请公布号2003/ 0065114中所述的，每个专利以引用的方式整体并入本文;通过使用基于钒的催化剂来制备，诸如在EP 1 367 069;JP 11301794和1].3.3,951，936中所述的，每个专利以引用的方式整体并入本文;或者通过使用基于钕的催化剂来获得，诸如在EP 0 964 008、EP 0 924 214 和美国专利号6,184,168;6,018,007;4931376;5,134,199 以及4,689,368 中所述的，每个专利以引用的方式整体并入本文）。 Incorporated herein; or a cobalt-based catalyst obtained by using, as in U.S. Patent Nos. 6,310,152; 5,448,002 and 5,089,574 and U.S. Patent Application Publication embodiment, each of said Patent No. 2003 / 0,065,114 by reference; 5,834,573; 5,753,761 incorporated herein; prepared by using a vanadium-based catalyst, such as in EP 1 367 069; JP 11301794 and 1] .3.3,951,936, each patent is incorporated by reference in its entirety herein; or neodymium-based catalyst obtained by using, as in EP 0 964 008, EP 0 924 214 and U.S. Pat. No. 6,184,168; and 5,134,199 incorporated herein in the embodiment of 4,689,368, each incorporated by reference); and 6,018,007; 4,931,376 . 本发明的组合物还可用于产生高冲击聚苯乙烯(HIPS)和丁二烯改性的丙烯腈-丁二烯-苯乙烯共聚物(ABS)(参见，例如，W0 2009/148932,其以引用的方式并入本文）。  The compositions of the present invention may also be used to produce high impact polystyrene (HIPS) and butadiene modified acrylonitrile - butadiene - styrene copolymer (the ABS) (see, e.g., W0 2009/148932 , which is incorporated by reference herein). 除非另外明确指示，否则如本文所用的"聚合物"旨在包括未改性聚合物和改性(即链端部改性或主链改性)聚合物。  Unless expressly indicated otherwise, as used herein "polymer" is intended to include modified and unmodified polymer (i.e., chain ends modified backbone or modified) polymers. 如本文所定义的烷基无论是这样还是与其他基团缔合诸如烷基芳基，包括直链烷基，诸如甲基(Me)、乙基(Et)、正丙基(Pr)、正丁基(Bu)、正戊基、正己基等;支链烷基，诸如异丙基、叔丁基等；以及环状烷基，诸如环己基。  The alkyl group as defined herein, or whether it is associated with other groups such as alkyl aryl groups, including straight-chain alkyl groups such as methyl (Me), ethyl (Et), propyl (Pr ), n-butyl (Bu), n-pentyl, n-hexyl and the like; branched-chain alkyl groups such as isopropyl, t-butyl and the like; and cyclic alkyl groups such as a cyclohexyl group. 丙基包括正丙基和异丙基。 Propyl includes n-propyl and isopropyl. 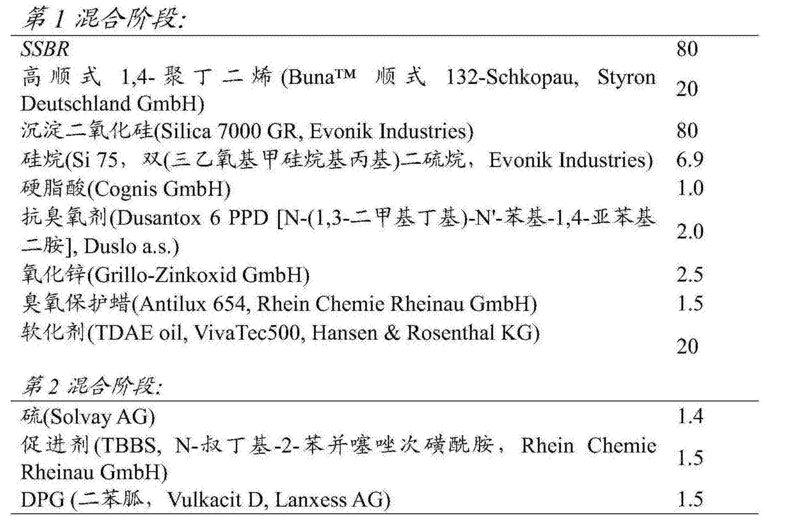 丁基包括正丁基、仲丁基、异丁基以及叔丁基。 Butyl includes n-butyl, sec-butyl and tert-butyl. 如本文所定义的芳基包括苯基、二苯基和其他苯环型化合物。  As defined herein, the aryl group include phenyl, diphenyl, and other benzenoid compounds. 芳基优选地含有仅一个芳族环并且最优选地含有C6芳族环。 Aryl groups preferably contain only one aromatic ring and most preferably containing a C6 aromatic ring. 如本文所定义的烷基芳基是指与一种或多种烷基键合的一种或多种芳基的组合， 例如为烷基-芳基、芳基-烷基、烷基_芳基-烷基以及芳基_烷基-芳基的组合。  The alkylaryl groups as defined herein refers to a combination of one or more with one or more alkyl groups bonded to an aryl group, for example, alkyl - aryl, aryl - alkyl, alkoxy aryl group _ - composition aryl - _ alkyl and aryl groups. 烷基芳基优选地含有仅一个芳族环并且最优选地含有C 6芳族环。 Alkylaryl groups preferably contain only one aromatic ring and most preferably containing an aromatic C 6 ring. 与多个化学残基的定义结合的表达"独立地选自[化学基团的列表]"旨在意指每个残基可独立地选自化学基团的列表。  Expression of the plurality of defined chemical binding residues "are independently selected from [a listing of chemical groups]" may be a list of the chemical group is intended to mean each independently selected residues. 例如，在化合物SiR 4中，其中每个R"独立地选自甲基、乙基、丙基以及丁基"，所有四个基团可为相同（诸如在四甲基硅烷Si (Me) 4中）或完全或部分不同（诸如在三甲基(丙基)硅烷中）。 For example, the compound SiR 4, wherein each R "is independently selected from methyl, ethyl, propyl and butyl", all four groups can be the same (such as tetramethylsilane Si (Me) 4 ) or completely or partially different (such as trimethyl (propyl) silane). 室温(RT或rt)是指20°C的温度。  room temperature (RT or rt) refers to a temperature of 20 ° C.
 提供以下实施例以便进一步说明本发明并且并不理解为限制性的。  The following examples are provided to further illustrate the present invention and are not to be construed as limiting. 通过SEC/RI使用HEWLETT PACKARD HP 1100进行分子量分析。  By SEC / RI using the HEWLETT PACKARD HP 1100 molecular weight analysis. 对洗脱剂THF进行在线脱气。 Of THF eluent online degassing. 溶剂流速为1. 〇ml/min。 The solvent flow rate was 1 〇ml / min. 每次分析注射lOOliL聚合物溶液。 Analysis of the polymer solution per injection lOOliL. 在40 °C下进行分析。 Analysis at 40 ° C. 最初基于聚苯乙烯校准计算分子量并在表中给出为聚苯乙烯。 Initially calculated molecular weight given in Table polystyrene calibration based on polystyrene. 除以从来自SEC/RI和SEC/MALLS 的分子量之间的早期比较推导的系数来确定真实分子量(SSBR分子量）。 It is determined by dividing the true molecular weight (SSBR molecular weight) derived from a comparison between the coefficient of early molecular weight from SEC / RI and SEC / MALLS of. 该系数的值取决于聚合物组成（苯乙烯和丁二烯含量）。 The value of this coefficient depends on the polymer composition (the content of styrene and butadiene). 将1.52的系数用于具有21%和25%苯乙烯的SSBR。 The coefficient of 1.52 for the SSBR having 21% and 25% styrene. 将Mp (作为SSBR)用于计算TMEDA摩尔比率。 The Mp (as SSBR) for calculating the molar ratio of TMEDA. 在BRUKER Avance 400上在5mm BB0探针中进行NMR光谱法。  NMR spectroscopy performed in 5mm BB0 probe on BRUKER Avance 400. 在表征数据中给出溶剂、频率和温度。 Given solvent, temperature and frequency characterization data. 使用在衰减全反射中测量的FTIR-光谱测定乙烯基含量和苯乙烯含量。  Determination of the vinyl content and styrene content in the measured spectrum using FTIR- attenuated total reflection. 将每种样品测量至少一次。  Each sample measured at least once. 测量含有两次加热运行。 Measurement comprising two heating operation. 使用第二次加热运行测定玻璃转化温度。 Glass transition temperature was measured using the second heat run. 使用无转子剪切流变仪(MDR 2000E)根据ASTM D 5289-95进行未硫化流变特征的测量以表征固化特征。  using a rotor-shear rheometer (MDR 2000E) ASTM D 5289-95 to measure rheological properties of unvulcanized according to characterize the curing characteristics. 在160°C下通过t95硫化测试件，尤其针对硬度和回弹性测试，在160 。 At 160 ° C t95 by vulcanizing test pieces, in particular for the testing of hardness and resilience at 160. (:下通过t95+5min硫化样本。在Zwick Z010上根据ASTM D 412测量在100%和300%变形时的抗张强度、断裂伸长率和模量。根据DIN 53516 (1987-06-01)测量DIN磨损。在0°C、RT和60 。(：下测量肖氏硬度A(ASTM D 2240)和回弹性（ISO 4662)。使用由Gabo Qualimeter Testanlagen GmbH(Germany)制造的动态光谱仪Eplexor 150N/500N以2Hz的频率米用-2% 的张力动态应变来测量作为在〇°C和60°C下的tanS的动态特征。在Doli 'Goodrich ' -挠度计上根据ASTM D 623方法A测量生热。 (: By t95 + 5min lower tensile strength when vulcanized samples deformed at 100% and 300% on a Zwick Z010 measured according to ASTM D 412, modulus and elongation at break according to DIN 53516 (1987-06-01).. measurement DIN abrasion (at 0 ° C, RT and 60: measured Shore hardness a (ASTM D 2240) and a resilience (ISO 4662) using a dynamic spectrometer Eplexor manufactured by Gabo Qualimeter Testanlagen GmbH (Germany) of 150N /. 500N at a frequency of 2Hz dynamic strain meter to measure dynamic characteristics as the square of tanS ° C to 60 ° C and with 2% tension Doli 'Goodrich' -. ASTM D 623 a method of measuring the deflection of the heat meter in accordance with . a)在rt下逐滴添加溴苯乙酮（10.0g，50.2mmol，1.0当量)于Et2〇(20ml)中的溶液。  a) at rt was added dropwise bromoacetophenone (10.0g, 50.2mmol, 1.0 eq. In) in Et2〇 (20ml) was added. 之后将反应混合物回流3.5h。 The reaction mixture was refluxed for 3.5h. 在rt下缓慢加入水（100ml)，接着加入稀HC1水溶液（1M， 50ml)。 At rt was slowly added water (100ml), followed by the addition of dilute aqueous HC1 (1M, 50ml). 分离各相并且用水(3x50ml)洗涤有机相。 The phases were separated and the organic phase was washed with water (3x50ml). 将有机层经硫酸镁干燥，过滤出干燥剂并且在减压下去除溶剂。 The organic layer was dried over magnesium sulfate, the drying agent was filtered off and the solvent was removed under reduced pressure. 直接使用粗黄色油（16. lg)而无需进一步纯化。 Without further purification a crude yellow oil (16. lg). b)将粗醇溶解在甲苯（150ml)中。  b) The crude alcohol was dissolved in toluene (150ml) in. 添加p-Tos0H水合物(400mg)并且将反应混合物与Dean Stark分水器回流3h。 Was added p-Tos0H hydrate (400 mg of) and the reaction mixture Dean Stark trap with reflux for 3h. 在rt下将反应混合物用水(30ml)洗涤并且将有机层经硫酸钠干燥，过滤出干燥剂并且在减压下去除溶剂。 At rt The reaction mixture was washed with water (30ml) and the organic layer was dried over sodium sulfate, the drying agent was filtered off and the solvent was removed under reduced pressure. 真空蒸馏产生呈淡黄色油的标题化合物1 (10 • 2g，39 • 4mmol，78 %)(参见C • A • van Walree、VEM Kaats-Richters、S • J • Veen、 B.Wieczorek、JHvan der Wiel、BCvan der Wiel,Eur.J.Org.Chem.2004,3046-3056)。 Vacuum distillation produced the title compound as a pale yellow oil 1 (10 • 2g, 39 • 4mmol, 78%) (see C • A • van Walree, VEM Kaats-Richters, S • J • Veen, B.Wieczorek, JHvan der Wiel , BCvan der Wiel, Eur.J.Org.Chem.2004,3046-3056). bp = 15〇-156°C (1.6mba;r)。  bp = 15〇-156 ° C (1.6mba; r). GC-MS(EI，70eV) :m/z(%) =258 (M+，56)，178(M+，100) ,89(21)，51(8)。  GC-MS (EI, 70eV): m / z (%) = 258 (M +, 56), 178 (M +, 100), 89 (21), 51 (8). 合物在rt下搅拌16h。 It was stirred 16h at rt. 过滤并去除溶剂产生一种残余物，其通过真空蒸馏纯化。 Filtration and removal of the solvent gave a residue, which was purified by vacuum distillation. 接收呈无色液体的氯氨基硅烷2a (4.58g，27.6mmol，71 %)。 Receiving chloro aminosilane was a colorless liquid 2a (4.58g, 27.6mmol, 71%). bp = 77-80 °C (30mbar)。  bp = 77-80 ° C (30mbar). 4 匪R(400MHz，20°C，C6D6) :S = 2.69 (q，J = 7. lHz，4H)，0.89 (t，J = 6.9Hz，6H)， 0 • 31 (s，6H) ppm。  4 bandit R (400MHz, 20 ° C, C6D6): S = 2.69 (q, J = 7. lHz, 4H), 0.89 (t, J = 6.9Hz, 6H), 0 • 31 (s, 6H ) ppm. 13C NMR(100MHz，20°C，C6D6) :S = 40.07 (2CH2)，15.38(2CH3)，1.94(2CH3)ppm。  13C NMR (100MHz, 20 ° C, C6D6): S = 40.07 (2CH2), 15.38 (2CH3), 1.94 (2CH3) ppm. 13C NMR(100MHz，20°C，C6D6) :S = 67.85 (2CH2) ,45.24 (2CH2) ,0.91 (2CH3) ppm。  13C NMR (100MHz, 20 ° C, C6D6): S = 67.85 (2CH2), 45.24 (2CH2), 0.91 (2CH3) ppm. 1. 〇当量)并且将反应混合物在rt下搅拌16h。 1. square eq) and the reaction mixture was stirred at rt 16h. 过滤并去除溶剂产生一种残余物，其通过真空蒸馏纯化。 Filtration and removal of the solvent gave a residue, which was purified by vacuum distillation. 接收呈无色液体的氯硅烷2c (11.5g，51. lmmol，66%)。 Receiving as a colorless liquid chlorosilane 2c (11.5g, 51. Lmmol, 66%). bp = 76-77 °C (40mbar)。  bp = 76-77 ° C (40mbar). 咕NMR (400MHz，20 °C，C6D6) : S = 0 • 90 (s，9H)，0 • 29 (s，6H)，0 • 07 (s，6H) ppm。  cushions NMR (400MHz, 20 ° C, C6D6): S = 0 • 90 (s, 9H), 0 • 29 (s, 6H), 0 • 07 (s, 6H) ppm. 4 匪R (400MHz，20°C，C6D6) :S = 2.84 (t，J = 4.9Hz,4H) ,2.09 (t，J = 4.6Hz，4H)， 2 • 10 (s，3H)，0 • 26 (s，6H) ppm。  4 bandit R (400MHz, 20 ° C, C6D6): S = 2.84 (t, J = 4.9Hz, 4H), 2.09 (t, J = 4.6Hz, 4H), 2 • 10 (s, 3H) , 0 • 26 (s, 6H) ppm. GC-MS(EI,70eV) :m/z (%) = 192 (M+, 100) , 177 (M+-CH3,17) ,157 (45) ,121 (63) ,93 (Me2SiCl+，64)。  GC-MS (EI, 70eV): m / z (%) = 192 (M +, 100), 177 (M + -CH3,17), 157 (45), 121 (63), 93 (Me2SiCl +, 64 ). bp = 93-95 °C (20mbar)。  bp = 93-95 ° C (20mbar). 4 NMR(400MHz，2(TC，C6D6) :8 = 2.73-2.62 (m，4H)，1.4卜1.33 (m，4H)，1.15 (sext， J = 7.4Hz，4H)，0.85(t，J = 7.3Hz，6H)，0.36 (s，6H) ppm。  4 NMR (400MHz, 2 (TC, C6D6): 8 = 2.73-2.62 (m, 4H), 1.4 Bu 1.33 (m, 4H), 1.15 (sext, J = 7.4Hz, 4H), 0.85 (t , J = 7.3Hz, 6H), 0.36 (s, 6H) ppm. GC-MS (El，70eV) :m/z(%) =221 (M+，5) ,178(100) ,136 (66)，93(Me2SiCl+，26)。  GC-MS (El, 70eV): m / z (%) = 221 (M +, 5), 178 (100), 136 (66), 93 (Me2SiCl +, 26). 匕卩=105_107。  Jie dagger = 105_107. 〇（20mbar)。 Billion (20mbar). 4 Mffi(400MHz，2(TC，C6D6) :S = 2.74(t，J = 5.2Hz，4H)，1.4hl.36(m，2H)，1.32-1 • 26 (m，4H)，0 • 29 (s，6H) ppm。  4 Mffi (400MHz, 2 (TC, C6D6): S = 2.74 (t, J = 5.2Hz, 4H), 1.4hl.36 (m, 2H), 1.32-1 • 26 (m, 4H), 0 • 29 (s, 6H) ppm. GC-MS (EI,70eV) :m/z (%) =177(M+,29) , 176 (M+-H, 100) , 162 (M+-CH3,17) ,142 (17) ,120(11)，93(Me2SiCl+，26)。  GC-MS (EI, 70eV): m / z (%) = 177 (M +, 29), 176 (M + -H, 100), 162 (M + -CH3,17), 142 (17), 120 (11), 93 (Me2SiCl +, 26). 并且将混合物搅拌1.5h。 And the mixture was stirred for 1.5h. 然后缓慢添加二乙胺(2.45g，33.4mmol，1.0当量)并且出现大量沉淀。 Was then slowly added diethylamine (2.45g, 33.4mmol, 1.0 eq.) And the large amount of precipitation. 将反应混合物在rt下搅拌3d。 The reaction mixture was stirred for 3d at rt. 过滤并去除溶剂产生一种残余物，其通过真空蒸馏纯化。 Filtration and removal of the solvent gave a residue, which was purified by vacuum distillation. 接收呈无色液体的氯氨基硅烷2g (7.64g，27. lmmol，81 %)。 Receiving a colorless liquid chlorine aminosilane 2g (7.64g, 27. Lmmol, 81%). bp = 77-79 °C (5mbar)。  bp = 77-79 ° C (5mbar). 4匪1? (40010^，20。(：，〇6〇6):8 = 2.80(9，了= 7.2泡，4扣，0.96(^ = 7.1泡，6扣， 0.94(s，9H)，0.37(s，3H)，0.14(s，3H)，0.13(s，3H)ppm。  1 4 bandit (40010 ^ 20 (:, 〇6〇6? ): 8 = 2.80 (9, the bubble = 7.2, 4 buckles, 0.96 (bubble ^ = 7.1, 6 deduction, 0.94 (s, 9H), 0.37 (s, 3H), 0.14 (s, 3H), 0.13 (s, 3H) ppm. bp = 160_165°C (6.6x10-3mbar)。  bp = 160_165 ° C (6.6x10-3mbar). 4 MMR (400MHz, 2(TC，C6D6) :S = 7.56-7.54(m，2H)，7.42-7.40 (m，2H) ,7.35-7.32 (m,2H) ,7.11-7.09 (m,3H) , 5.44 (d, J= 1.4Hz , 1H) ,5.40 (d, J= 1.3Hz , 1H) ,2.79(q,J = 7.0Hz，4H) ,0.99 (t，J = 7.0Hz，6H) ,0.32 (s，6H) ppm。  4 MMR (400MHz, 2 (TC, C6D6): S = 7.56-7.54 (m, 2H), 7.42-7.40 (m, 2H), 7.35-7.32 (m, 2H), 7.11-7.09 (m, 3H), 5.44 (d, J = 1.4Hz, 1H), 5.40 (d, J = 1.3Hz, 1H), 2.79 (q, J = 7.0Hz, 4H), 0.99 (t, J = 7.0Hz, 6H) , 0.32 (s, 6H) ppm. GC-MS(EI,70eV) :m/z (%) =309 (M+,9) ,294 (M+-CH3,95) ,237 (M+-NEt2,100) ,178 (7) ,147 ⑵，103 ⑷。  GC-MS (EI, 70eV): m / z (%) = 309 (M +, 9), 294 (M + -CH3,95), 237 (M + -NEt2,100), 178 (7), 147 ⑵, 103 ⑷. 拌10分钟。 Stirred for 10 minutes. 在-80°C下添加氯氨基硅烷2b (5.83g，32.4mmol，1.40当量)并且随后将混合物在rt下搅拌30min。 Chloroformate aminosilane 2b (5.83g, 32.4mmol, 1.40 eq.) At -80 ° C and then the mixture was stirred at rt 30min. 因此，出现颜色变成亮黄色，指示完全转化。 Accordingly, it turned bright yellow color appears, indicating complete conversion. 然后添加吗啉（1.51g， 17.4mmol ,0.75当量)并且减少溶剂。 Was then added morpholine (1.51g, 17.4mmol, 0.75 eq.) And the solvent reduced. 添加环己烷(50ml)并过滤，接着去除溶剂，产生一种油状残余物，其真空蒸馏。 Cyclohexane (50ml) and filtered, then the solvent was removed to produce an oily residue which was vacuum distilled. 接收呈黄色油状物的I-lb (5.78g，17.9mmol，77%)。 Receiving as a yellow oil I-lb (5.78g, 17.9mmol, 77%). bp = 163_170°C (6x10-3mbar)。  bp = 163_170 ° C (6x10-3mbar). 4 Mffi(400MHz，20°C，C6D6) :S = 7.49-7.47 (m，2H)，7.4卜7.39 (m，2H) ,7.35-7.32 (m,2H) ,7.12-7.10(m,3H) , 5.45 (d ,J= 1.3Hz , 1H) ,5.40 (d, J= 1.3Hz , 1H) , 3.45-3.42 (m, 4H) ,2.7卜2.69(m，4H) ,0.21 (s，6H)ppm。  4 Mffi (400MHz, 20 ° C, C6D6): S = 7.49-7.47 (m, 2H), 7.4 Bu 7.39 (m, 2H), 7.35-7.32 (m, 2H), 7.12-7.10 (m, 3H), 5.45 (d, J = 1.3Hz, 1H), 5.40 (d, J = 1.3Hz, 1H), 3.45-3.42 (m, 4H), 2.7 Bu 2.69 (m, 4H), 0.21 (s, 6H ) ppm. GC-MS(EI，70eV) :m/z(%) =323 (M+，65)，308 (M+-CH3,41)，278 ⑵，237 (M+-NC4H80， 100)，206 (7) ,178 (13)，145(3)，118 ⑶。  GC-MS (EI, 70eV): m / z (%) = 323 (M +, 65), 308 (M + -CH3,41), 278 ⑵, 237 (M + -NC4H80, 100), 206 (7 ), 178 (13), 145 (3), 118 ⑶.
 bp = 145_150°C (6.8x10-3mbar)。  bp = 145_150 ° C (6.8x10-3mbar). 4 Mffi(400MHz，2(TC，C6D6) :S = 7.57-7.55 (m，2H)，7.40-7.38 (m，2H) ,7.33-7.30 (m,2H) ,7.11-7.08 (m,3H) , 5.42 (d ,J= 1.3Hz , 1H) , 5.39 (d ,J= 1.3Hz , 1H) ,0.94(s,9H), 0 • 34 (s，6H)，0 • 07 (s，6H) ppm。  4 Mffi (400MHz, 2 (TC, C6D6): S = 7.57-7.55 (m, 2H), 7.40-7.38 (m, 2H), 7.33-7.30 (m, 2H), 7.11-7.08 (m, 3H), 5.42 (d, J = 1.3Hz, 1H), 5.39 (d, J = 1.3Hz, 1H), 0.94 (s, 9H), 0 • 34 (s, 6H), 0 • 07 (s, 6H ) ppm. GC-MS(EI,70eV) :m/z (%) =368 (M+,l) ,353 (M+-CH3,2) ,311 (M+-C4H9,100) ,221 (49) ,193(18) ,155(9) ,103(8) ,73(12)。  GC-MS (EI, 70eV): m / z (%) = 368 (M +, l), 353 (M + -CH3,2), 311 (M + -C4H9,100), 221 (49), 193 (18), 155 (9), 103 (8), 73 (12). 度下30min之后，使混合物升温至rt。 After 30min the degree, the mixture was warmed to rt. 将溶液在rt下搅拌10分钟。 The solution was stirred at rt 10 min. 在-80 °C下添加氯氨基硅烷2d (179mg，0.926mmol，1.20当量)并且随后将混合物在rt下搅拌30min。 Chloroformate aminosilane 2d (179mg, 0.926mmol, 1.20 eq) at -80 ° C and then the mixture was stirred at rt 30min. 因此，出现颜色变成亮黄色，指示完全转化。 Accordingly, it turned bright yellow color appears, indicating complete conversion. GC/MS分析指示溴芳烃1到标题化合物I-ld的转化。 GC / MS analysis indicated conversion to the title compound 1-bromo-aromatics I-ld's. 纯度:74%。 Purity: 74%. GC-MS(EI，70eV):m/z(%)=336 (M+，63)，321(M+-CH3,6)，294®，266 (19)，237 (M +-N2C5Hii，100) ,156(17) ,99 ⑶。  GC-MS (EI, 70eV): m / z (%) = 336 (M +, 63), 321 (M + -CH3,6), 294®, 266 (19), 237 (M + -N2C5Hii, 100), 156 (17), 99 ⑶. 在-80°C下添加氯氨基硅烷2e (240mg，1 .OSmmol，1.40当量)并且随后将混合物在rt下搅拌30min。 Chloroformate aminosilane 2e (240mg, 1 .OSmmol, 1.40 equiv) at -80 ° C and then the mixture was stirred at rt 30min. 因此，出现颜色变成亮黄色，指示完全转化。 Accordingly, it turned bright yellow color appears, indicating complete conversion. 然后添加二丁基胺（50mg，0.39mmol， 0.50当量)和环己基(5ml) XC/MS分析指示溴芳烃1到标题化合物I-le的转化。 Was then added dibutylamine (50mg, 0.39mmol, 0.50 equiv.) And cyclohexyl (5ml) XC / MS analysis indicated conversion to the title compound 1-bromo-aromatics I-le's. 纯度:62%。 Purity: 62%. GC-MS(EI,70eV) :m/z (%) =365 (M+,4) ,350 (M+-CH3,3) ,322 (M+-C3H7,100) ,280 (4) ,237 (M+-NC8Hi8,100) ,178 (7) ,118 (12)。  GC-MS (EI, 70eV): m / z (%) = 365 (M +, 4), 350 (M + -CH3,3), 322 (M + -C3H7,100), 280 (4), 237 (M + -NC8Hi8,100), 178 (7), 118 (12). min。 min. 因此，出现颜色变成亮黄色，指示完全转化。 Accordingly, it turned bright yellow color appears, indicating complete conversion. 然后添加二乙胺(452mg,6.18mmol ,0.80当量)并且减少溶剂。 Was then added diethylamine (452mg, 6.18mmol, 0.80 equiv.) And the solvent reduced. 添加环己烷(25ml)并过滤，接着去除所有挥发性物质(于4x10 3mbar和90 °C)，接收90%纯度的呈无色油状物的油状残余物I-lf (2.30g，5.40mmol，70%)。 Cyclohexane (25ml) and filtered, followed by removal of all volatiles (4x10 3mbar and at 90 ° C), 90% purity receiving a colorless oil oily residue I-lf (2.30g, 5.40mmol, 70%). Mffi(400MHz，2(TC，C6D6) :S = 7.73-7.71 (m，2H)，7.43-7.41 (m，2H) ,7.33-7.31 (m,2H) ,7.11-7.08 (m,3H) ,5.43 (d, J= 1.2Hz , 1H) , 5.37 (d ,J= 1.2Hz , 1H) ,2.88 (dq,J = 14.0Hz , J = 7.0Hz , 2H) , 2.84 (dq, J = 14.1Hz , J = 6.9Hz , 2H) , 1.01 (s , 9H) , 0.97 (t, J = 7.0Hz，6H) ,0.36 (s，3H) ,0.15 (s，6H) ppm。  Mffi (400MHz, 2 (TC, C6D6): S = 7.73-7.71 (m, 2H), 7.43-7.41 (m, 2H), 7.33-7.31 (m, 2H), 7.11-7.08 (m, 3H ), 5.43 (d, J = 1.2Hz, 1H), 5.37 (d, J = 1.2Hz, 1H), 2.88 (dq, J = 14.0Hz, J = 7.0Hz, 2H), 2.84 (dq, J = 14.1 hz, J = 6.9Hz, 2H), 1.01 (s, 9H), 0.97 (t, J = 7.0Hz, 6H), 0.36 (s, 3H), 0.15 (s, 6H) ppm. 13C 匪R(100MHz，20°C，C6D6) :S = 150• 78(C)，142.76 (C)，142• 00(C)，138• 58(C)， 134.50 (2CH) ,128.73 (2CH) , 128.49 (2CH) , 127.97 (2CH) ,127.92 (CH) , 114.53 (CH2) 39.85 (2CH2) ,26.06 (3CH3)，18.54(C) ,15.90 (2CH3)，-0.75 (CH3)，-2.61 (CH3)，-2.62 (CH3) ppm。  13C bandit R (100MHz, 20 ° C, C6D6): S = 150 • 78 (C), 142.76 (C), 142 • 00 (C), 138 • 58 (C), 134.50 (2CH), 128.73 (2CH), 128.49 (2CH), 127.97 (2CH), 127.92 (CH), 114.53 (CH2) 39.85 (2CH2), 26.06 (3CH3), 18.54 (C), 15.90 (2CH3), - 0.75 (CH3), - 2.61 (CH3), - 2.62 (CH3) ppm. GC-MS(EI,70eV) :m/z (%) =425 (M+,7) ,410 (M+-CH3,100) ,368 (15) ,311 (23) ,281 (3) ,221 (21) ,193(46) ,147(24) ,103(11) ,73(13)。  GC-MS (EI, 70eV): m / z (%) = 425 (M +, 7), 410 (M + -CH3,100), 368 (15), 311 (23), 281 (3), 221 (21), 193 (46), 147 (24), 103 (11), 73 (13). mol%)牙uliu 丄^tcumg,丄u.ommo 丄，兮里厂j 卞口、jy廿义1r1 比百'切1 工亚H 下在90°C下搅拌3h。  mol%) teeth uliu Shang ^ tcumg, Shang u.ommo Shang, Xi j Bian port in plants, JY 1r1 than one hundred twenty-defined 'cut alkylene station 1 H stirred at 90 ° C 3h. 将棕色反应混合物冷却至rt，然后添加环己烷(25ml)和NaHC03饱和水溶液(25ml)。 The brown reaction mixture was cooled to rt, then cyclohexane (25ml) and saturated aqueous NaHC03 (25ml). 分离各层。 The layers were separated. 用EA (20ml)提取水相并且用水(3x15ml)洗涤合并的有机相。 The organic phase was extracted with EA (20ml) and washed with water (3 x 15 mL) washed with. 将有机相经Na2S〇4干燥，过滤出干燥剂并且在减压下去除溶剂。 Na2S〇4 The organic phase was dried, the drying agent was filtered off and the solvent was removed under reduced pressure. 通过柱色谱法(Si0 2，CH/EA= 100:0 至95:5)纯化粗黄色油状物。 By column chromatography (Si0 2, CH / EA = 100: 0 to 95: 5) to give a crude yellow oil. 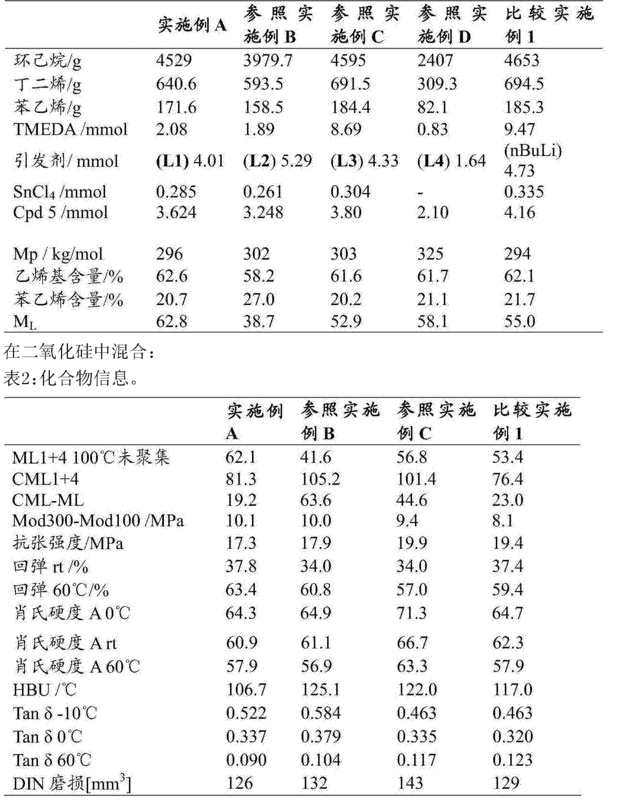 接收呈无色油状物的芳烃3 (570mg，2.60mmol，96%)。 Receiving a colorless oil aromatics 3 (570mg, 2.60mmol, 96%). Rf = 0.65 (环己烷/EA=10:1)。  Rf = 0.65 (cyclohexane / EA = 10: 1). 4 NMR (400MHz，2(TC，CDC13) : 8 = 7.34-7.30 (m，5H)，7.28-7.26 (m，2H) ,7.17-7.15 (m,2H) ,5.99(ddt ,J = 16.9Hz ,J= 10.1Hz,J = 6.8Hz,1H) ,5.44 (d ,J= 1.2Hz, 1H) ,5.43 (dj =1.2Hz , 1H) , 5.10 (ddt, J= 16.9Hz ,J= 1.7Hz ,J= 1.6Hz , 1H) , 5.09 (dtd ,J= 10.0Hz ,J = 1.6Hz，J = 1.2Hz，lH) ,3.40 (d，J = 6.7Hz, 1H) ppm。  4 NMR (400MHz, 2 (TC, CDC13): 8 = 7.34-7.30 (m, 5H), 7.28-7.26 (m, 2H), 7.17-7.15 (m, 2H), 5.99 (ddt, J = 16.9Hz, J = 10.1Hz, J = 6.8Hz, 1H), 5.44 (d, J = 1.2Hz, 1H), 5.43 (dj = 1.2Hz, 1H), 5.10 (ddt, J = 16.9Hz, J = 1.7 hz, J = 1.6Hz, 1H), 5.09 (dtd, J = 10.0Hz, J = 1.6Hz, J = 1.2Hz, lH), 3.40 (d, J = 6.7Hz, 1H) ppm. GC-MS(EI,70eV) :m/z(%) =220 (M+, 100) ,205 (31) ,178 (49) ,141 (14) ,117 (50), 103 (73) ,91 (15) ,77 (23)。  GC-MS (EI, 70eV): m / z (%) = 220 (M +, 100), 205 (31), 178 (49), 141 (14), 117 (50), 103 (73) , 91 (15), 77 (23). mg，2.38mmol，1.05当量）之后，添加Karstedt催化剂于二甲苯（2.1重量％-2.4重量％Pt， 20mg，2• 3wnol，0 • lmol %)并且将反应混合物在rt下搅拌3h。 mg, 2.38mmol, then 1.05 eq.) was added in xylene Karstedt catalyst (2.1 wt.% to 2.4 wt% Pt, 20mg, 2 • 3wnol, 0 • lmol%) and the reaction mixture was stirred at rt 3h. 获取GC/MS等分试样并且其显示正确分子质量。 Get GC / MS aliquot and the display is correct molecular mass. 直接使用标题化合物以制备硅烷胺。 The title compound was prepared directly using an amine silane. GC-MS(EI,70eV) :m/z(%) =314(M+,63) ,286 (9) ,193 (100) ,165 (9) ,141 (1) ,115 (10)，93(Me2SiCl+，92) ,65(9)。  GC-MS (EI, 70eV): m / z (%) = 314 (M +, 63), 286 (9), 193 (100), 165 (9), 141 (1), 115 (10) , 93 (Me2SiCl +, 92), 65 (9). mg，2.38mmol，1.05当量）之后，添加Karstedt催化剂于二甲苯（2.1重量％-2.4重量％Pt， 20mg，2.3iimol，0. lmol%)中的溶液并且将反应混合物在rt下搅拌4h。 mg, 2.38mmol, then 1.05 eq.) was added in xylene Karstedt catalyst (2.1 wt.% to 2.4 wt% Pt, 20mg, 2.3iimol, in 0. lmol%) and the reaction mixture was stirred at rt 4h. 然后添加二乙胺(498mg，6.81mmol，3.0当量)并且将反应混合物再搅拌16h。 Was then added diethylamine (498mg, 6.81mmol, 3.0 eq) and the reaction mixture was stirred for 16h. 在过滤并在真空中去除所有挥发性物质（4 X10_3mbar，90°C)之后，接收呈褐色油状物的硅烷胺I-2a(577mg，1.64mm 〇l， 72%)。 After filtration and removal of all volatiles (4 X10_3mbar, 90 ° C) in vacuo, a brown oil was received silane amine I-2a (577mg, 1.64mm 〇l, 72%). 纯度:95% (NMR)。 Purity: 95% (NMR). XH NMR (400MHz, 20 °C,C6D6) : 8 = 7.36-7.32 (m,4H) , 7.14-7.06 (m, 5H) ,5.41 (d ,J = 1.4Hz,lH) ,5.36 (d ,J=1.4Hz,lH) ,2.71 (q ,J = 7.0Hz ,4H) , 2.57 (t ,J = 7.6Hz , 2H) ,1.69-1.61 (m，2H)，0.93(t，J = 7.6Hz，6H) ,0.6 卜0.56 (m，2H) ,0.06 (s，6H) ppm。  XH NMR (400MHz, 20 ° C, C6D6): 8 = 7.36-7.32 (m, 4H), 7.14-7.06 (m, 5H), 5.41 (d, J = 1.4Hz, lH), 5.36 (d , J = 1.4Hz, lH), 2.71 (q, J = 7.0Hz, 4H), 2.57 (t, J = 7.6Hz, 2H), 1.69-1.61 (m, 2H), 0.93 (t, J = 7.6Hz , 6H), 0.6 Bu 0.56 (m, 2H), 0.06 (s, 6H) ppm. 13C 匪R(100MHz，20°C，C6D6) :S = 150.66 (C)，142.69 (C)，142.25(C)，139.48 (C)， 128.73 (4CH) , 128.67 (2CH) ,128.47 (2CH) ,127.90 (CH) , 113.73 (CH2) ,40.32 (2CH2) ,40.05 (CH2)，26 • 53 (CH2)，17 • 19 (CH2)，16 • 18 (2CH3)，_ 1 • 59 (2CH3) ppm。  13C bandit R (100MHz, 20 ° C, C6D6): S = 150.66 (C), 142.69 (C), 142.25 (C), 139.48 (C), 128.73 (4CH), 128.67 (2CH), 128.47 ( 2CH), 127.90 (CH), 113.73 (CH2), 40.32 (2CH2), 40.05 (CH2), 26 • 53 (CH2), 17 • 19 (CH2), 16 • 18 (2CH3), _ 1 • 59 (2CH3 ) ppm. GC-MS(EI,70eV) :m/z (%) =351 (M+,23) ,336 (M+-CH3,13) ,279 (M+-NC2Hi〇, 100), 250 (6) ,220 ⑷，175 (17) ,130 (69) ,102 (25) ,59 (71)。  GC-MS (EI, 70eV): m / z (%) = 351 (M +, 23), 336 (M + -CH3,13), 279 (M + -NC2Hi〇, 100), 250 (6), 220 ⑷, 175 (17), 130 (69), 102 (25), 59 (71). 烷（225mg，2 • 38mmol，1 • 05当量）之后，添加Karstedt催化剂于二甲苯（2 • 1重量％-2 • 4重量％Pt，20mg，2.3wnol，0. lmol %)中的溶液并且将反应混合物在rt下搅拌4h。 After dioxane (225mg, 2 • 38mmol, 1 • 05 equiv) was added Karstedt catalyst in xylene (2 • 1 wt% -2 • 4 wt% Pt, 20mg, 2.3wnol, 0. Lmol%) and was the reaction mixture was stirred for 4h at rt. 然后添加二丁胺(61611^，4.77111111〇1，2.0当量)并且将反应混合物再搅拌1611。 Was then added dibutylamine (61611 ^, 4.77111111〇1,2.0 eq) and the reaction mixture was stirred 1611. 在过滤并在真空中去除所有挥发性物质(4x10- 3mbar，90°C)之后，接收呈褐色油状物的硅烷胺I_2b (734mg，1.80mmol， 79%)。 After filtration and removal of all volatiles (4x10- 3mbar, 90 ° C) in vacuo, a brown oil receiving amine silane I_2b (734mg, 1.80mmol, 79%). 纯度:约95% (NMR)。 Purity: about 95% (NMR). GC-MS (El，70eV) :m/z(%) =407 (M+, 11) ,364(54) ,279 (M+-NBU2,100) ,220 (6) ,175 (31) ,135 (17) ,86 (28) ,59 (61)。  GC-MS (El, 70eV): m / z (%) = 407 (M +, 11), 364 (54), 279 (M + -NBU2,100), 220 (6), 175 (31), 135 (17), 86 (28), 59 (61). 后，添加Karstedt催化剂于二甲苯（2 • 1 重量％-2 • 4重量％Pt，20mg，2 • 3_〇1，0 • lmol %)中的溶液并且将反应混合物在rt下搅拌4h。 After Karstedt catalyst was added in xylene (2 • 1 wt% -2 • 4 wt% Pt, 20mg, 2 • 3_〇1,0 • lmol%) solution and the reaction mixture was stirred at rt 4h. 然后添加吗啉(593mg，6.81mmol，3.0当量)并且将反应混合物再搅拌16h。 Then morpholine (593mg, 6.81mmol, 3.0 eq) and the reaction mixture was stirred for 16h. 在过滤并在真空中去除所有挥发性物质(4x10 3mbar,90°C)之后，接收呈褐色油状物的硅烷胺1-2〇(45811^，1.25臟〇1，55%)。 After filtration and removal of all volatiles (4x10 3mbar, 90 ° C) in vacuo, a brown oil receiving amine 1-2〇 silane (45811 ^, dirty 〇1,55 1.25%). 纯度:95%(匪1? )。 Purity: 95% (1 bandit?). 咕NMR (400MHz，2(TC，C6D6) : 8 = 7.37-7.33 (m，4H) ,7.13-7.06 (m，5H)，5.42(d，J = 1.4Hz,lH) ,5.37 (d,J=1.4Hz,lH) , 3.44-3.42 (m, 4H) , 2.62-2.60 (m, 4H) ,2.55 (t,J = 7.6Hz，2H) ,1.6卜1.54(m，2H) ,0.5卜0.47(m，2H)，-0.06(s，6H)ppm。  cushions NMR (400MHz, 2 (TC, C6D6): 8 = 7.37-7.33 (m, 4H), 7.13-7.06 (m, 5H), 5.42 (d, J = 1.4Hz, lH), 5.37 (d , J = 1.4Hz, lH), 3.44-3.42 (m, 4H), 2.62-2.60 (m, 4H), 2.55 (t, J = 7.6Hz, 2H), 1.6 Bu 1.54 (m, 2H), 0.5 BU 0.47 (m, 2H), - 0.06 (s, 6H) ppm. 13C 匪R(100MHz，2(TC，C6D6) :S = 150.60 (C)，142.48 (C)，142.19(C) ,139.60 (C)， 128.71 (4CH) ,128.49 (2CH) ,128.32 (2CH) , 127.94 (CH) , 113.82 (CH2) ,68.65 (2CH2) ,45.93 (2CH2)，39 • 85 (CH2)，26 • 25 (CH2)，15 • 92 (CH2)，_2 • 81 (2CH3) ppm。  13C bandit R (100MHz, 2 (TC, C6D6): S = 150.60 (C), 142.48 (C), 142.19 (C), 139.60 (C), 128.71 (4CH), 128.49 (2CH), 128.32 ( 2CH), 127.94 (CH), 113.82 (CH2), 68.65 (2CH2), 45.93 (2CH2), 39 • 85 (CH2), 26 • 25 (CH2), 15 • 92 (CH2), _ 2 • 81 (2CH3) ppm. GC-MS (El，70eV) :m/z(%) =365 (M+，67)，350 (M+-CH3,7)，320 (1) ,279 (19)，250 (28) ,220 ⑶，178 (15) ,144(69) ,102(100) ,59(88)。  GC-MS (El, 70eV): m / z (%) = 365 (M +, 67), 350 (M + -CH3,7), 320 (1), 279 (19), 250 (28), 220 ⑶, 178 (15), 144 (69), 102 (100), 59 (88). 纯度:约80%(匪幻（近似计算的产率:0.998,2.12臟〇1，93%)。  Purity: 80% (phantom bandit (approximate yield calculated: 0.998,2.12 dirty 〇1,93%). GC-MS (El，70eV) :m/z(%) =467 (M+,44) ,452 (M+-CH3,36) ,438 (9) ,410 (15) ,395 (61) ,353(11) ,295(19) ,246(81) ,207(38) ,133(100) ,58(60)。  GC-MS (El, 70eV): m / z (%) = 467 (M +, 44), 452 (M + -CH3,36), 438 (9), 410 (15), 395 (61), 353 (11), 295 (19), 246 (81), 207 (38), 133 (100), 58 (60). GC-MS(EI,70eV) :m/z (%) =367 (M+,7) ,352 (M+-CH3,100) ,295 (47) ,259 (3) ,224 (11) ,167(11) ,140 ⑶，111 (11) ,85(17) ,57(41)。  GC-MS (EI, 70eV): m / z (%) = 367 (M +, 7), 352 (M + -CH3,100), 295 (47), 259 (3), 224 (11), 167 (11), 140 ⑶, 111 (11), 85 (17), 57 (41). GC-MS(EI,70eV) :m/z(%) =381 (M+,85) ,366 (M+-CH3,81) ,336 (12) ,295 (100) ,252 (28) ,224(42) ,193 (15) ,165 (25) ,135 (20) ,91 (19) ,59 (27)。  GC-MS (EI, 70eV): m / z (%) = 381 (M +, 85), 366 (M + -CH3,81), 336 (12), 295 (100), 252 (28), 224 (42), 193 (15), 165 (25), 135 (20), 91 (19), 59 (27). GC-MS(EI，70eV):m/z(%)=411(M+-CH3,3)，369 (M+-C4H9，100)，279 ®，209 (32)， 179 ⑵，149 (42) ,119(11)，91 (100)，57(5)。  GC-MS (EI, 70eV): m / z (%) = 411 (M + -CH3,3), 369 (M + -C4H9,100), 279 ®, 209 (32), 179 ⑵, 149 ( 42), 119 (11), 91 (100), 57 (5). L1为根据本发明的式2的引发剂，其由根据式1的前体化合物制备，而L2-L4为现有技术实例（参见W02014/040640、US2003/0114592、US2003/0114611、W02000/050479、 W02000050478以及JP2012241112A)。  L1 according to the present invention, the initiators of Formula 2, which is prepared from a precursor compound of Formula 1 according to the prior art L2-L4 example (see W02014 / 040640, US2003 / 0114592, US2003 / 0114611, W02000 / 050479, W02000050478 and JP2012241112A). 将环己烷(4259.2g)、丁二烯(625.7g)和苯乙烯（171.6g)装入无空气101反应器中并且将搅拌的混合物加热至40°C。  Cyclohexane (4259.2g), butadiene (625.7g) and styrene (171.6 g of) was charged in the reactor was air-free 101 and the stirred mixture was heated to 40 ° C. 然后添加TMEDA (0.24g)并且逐滴装入正丁基锂以使杂质反应直到反应混合物的颜色变为淡黄色(滴定）。 Was then added TMEDA (0.24g) was charged and added dropwise to n-butyllithium impurities in the reaction mixture until the reaction color turned yellowish (titration). 在此之后立即装入在环己烷中对应于聚合物的目标分子量的配方量的LI (4.01mmol，c = 0.193mol/kg)，以开始聚合。 Immediately thereafter charged in cyclohexane corresponding to the target molecular weight of the polymer formulation amount LI (4.01mmol, c = 0.193mol / kg), to start polymerization. 将装入引发剂的起始时间用作聚合的起始时间。 The initiator was charged the start time as the start time of the polymerization agent. 同时从装入引发剂开始到最终聚合物温度60°C通过在反应器壁内加热或冷却来增加温度，持续80min。 While starting from the initiator was charged to a final polymer to a temperature of 60 ° C increase in temperature by heating or cooling the reactor walls for 80min. 然后装入丁二烯（3.3g)，接着通过圆筒装入SnCl4(0.28mmol)和50g环己烷。 Then charged with butadiene (3.3g), was charged followed by SnCl4 (0.28mmol) and 50g of cyclohexane through the barrel. 使反应在15分钟内完成，接着最后一次添加丁二烯(11.6g)。 The reaction was completed within 15 minutes, followed by the last addition of butadiene (11.6g). 在5min后，添加链端部改性剂3-甲氧基-3，8，8，9，9-五甲基-2-氧杂-7-硫杂-3，8-二娃杂癸烧（disiladecane) (5) (1.02g)。 After 5min, add the chain end modifying agent -3,8,8,9,9- pentamethyl-3-methoxy-2-oxa-7-thia-3,8-decyl burn heteroaryl Erwa (disiladecane) (5) (1.02g). 在装入甲醇（4.01g)20min之后终止反应。 The reaction was terminated after 20min was charged in methanol (4.01g). 用Irganox 1520D (2.03g)稳定聚合物溶液，通过汽提回收聚合物并干燥直到获得〈0.6 %含量的残余挥发物。 With (2.03 g of) a stable polymer solution Irganox 1520D, the polymer was recovered by steam stripping and dried until <0.6% residual volatiles content. 在表1中给出样品的完整数据集。 Complete data set are given in Table 1 samples. 将环己烷(3979.7g)、丁二烯(579.5g)和苯乙烯（158.5g)装入无空气101反应器中并且将搅拌的混合物加热至40°C。  Cyclohexane (3979.7g), butadiene (579.5g) and styrene (158.5 g) was charged in the reactor was air-free 101 and the stirred mixture was heated to 40 ° C. 然后添加TMEDA (0.22g)并且逐滴装入正丁基锂以使杂质反应直到反应混合物的颜色变为淡黄色(滴定）。 Was then added TMEDA (0.22g) was charged and added dropwise to n-butyllithium impurities in the reaction mixture until the reaction color turned yellowish (titration). 在此之后立即装入在环己烷中对应于聚合物的目标分子量的配方量的L2 (5 • 29mmo 1，c = 0 • 20lmo 1 /kg)，以开始聚合。 Immediately thereafter in cyclohexane was charged in the formulation corresponding to the amount of target molecular weight of the polymer L2 (5 • 29mmo 1, c = 0 • 20lmo 1 / kg), to start polymerization. 将装入引发剂的起始时间用作聚合的起始时间。 The initiator was charged the start time as the start time of the polymerization agent. 同时从装入引发剂开始到最终聚合物温度60°C通过在反应器壁内加热或冷却来增加温度，持续80min。 While starting from the initiator was charged to a final polymer to a temperature of 60 ° C increase in temperature by heating or cooling the reactor walls for 80min. 然后装入丁二烯（3. lg)，接着通过圆筒装入SnCl4(0.26mmol)和50g环己烷。 Then charged with butadiene (3. lg), then loaded SnCl4 (0.26mmol) and 50g of cyclohexane through the barrel. 使反应在15分钟内完成，接着最后一次添加丁二烯(10.9g)。 The reaction was completed within 15 minutes, followed by the last addition of butadiene (10.9g). 在5min后，添加链端部改性剂3-甲氧基-3，8，8，9，9-五甲基-2-氧杂-7-硫杂-3，8-二硅杂癸烷（5) (0.96g)。 After 5min, the chain end modifying agent was added 3-methoxy -3,8,8,9,9- pentamethyl-2-oxa-7-thia-sila-3,8-decane (5) (0.96g). 在装入甲醇（3.75g)20min之后终止反应。 The reaction was terminated after 20min was charged in methanol (3.75g). 用Irganox 1520D (1.90g)稳定聚合物溶液，通过汽提回收聚合物并干燥直到获得〈0.6%含量的残余挥发物。 With (1.90 g of) a stable polymer solution Irganox 1520D, the polymer was recovered by steam stripping and dried until <0.6% residual volatiles content. 在表1中给出样品的完整数据集。 Complete data set are given in Table 1 samples. 将环己烷(4595g)、丁二烯(675.3g)和苯乙烯（184.4g)装入无空气101反应器中并且将搅拌的混合物加热至40°C。  Cyclohexane (4595g), butadiene (675.3g) and styrene (184.4 g) was charged in the reactor was air-free 101 and the stirred mixture was heated to 40 ° C. 然后添加TMEDA (1. Olg)并且逐滴装入正丁基锂以使杂质反应直到反应混合物的颜色变为淡黄色(滴定）。 Was then added TMEDA (1. Olg) was charged and added dropwise to n-butyllithium impurities in the reaction mixture until the reaction color turned yellowish (titration). 在此之后立即装入在环己烷中对应于聚合物的目标分子量的配方量的L3 (4.33mmol，c = 0.191mol/kg)，以开始聚合。 Immediately thereafter in cyclohexane was charged in the formulation corresponding to the amount of target molecular weight of the polymer L3 (4.33mmol, c = 0.191mol / kg), to start polymerization. 将装入引发剂的起始时间用作聚合的起始时间。 The initiator was charged the start time as the start time of the polymerization agent. 同时从装入引发剂开始到最终聚合物温度60°C通过在反应器壁内加热或冷却来增加温度，持续80min。 While starting from the initiator was charged to a final polymer to a temperature of 60 ° C increase in temperature by heating or cooling the reactor walls for 80min. 然后装入丁二烯（3.41g)，接着通过圆筒装入SnCl4 (0.304mmol)和50g环己烷。 Then charged with butadiene (3.41g), was charged followed by SnCl4 (0.304mmol) and 50g of cyclohexane through the barrel. 使反应在15分钟内完成，接着最后一次添加丁二烯(12.8g)。 The reaction was completed within 15 minutes, followed by the last addition of butadiene (12.8g). 在5min后，添加链端部改性剂3-甲氧基-3，8，8，9，9-五甲基-2-氧杂-7-硫杂-3，8-二硅杂癸烷（5) (1.12g)。 After 5min, the chain end modifying agent was added 3-methoxy -3,8,8,9,9- pentamethyl-2-oxa-7-thia-sila-3,8-decane (5) (1.12g). 在装入甲醇（4.33g)20min之后终止反应。 The reaction was terminated after 20min was charged in methanol (4.33g). 用Irganox 1520D (2.19g)稳定聚合物溶液，通过汽提回收聚合物并干燥直到获得〈0.6%含量的残余挥发物。 With (2.19 g of) a stable polymer solution Irganox 1520D, the polymer was recovered by steam stripping and dried until <0.6% residual volatiles content. 在表1中给出样品的完整数据集。 Complete data set are given in Table 1 samples. 将环己烷(2407g)、丁二烯（301.5g)和苯乙烯(82. lg)装入无空气51反应器中并且将搅拌的混合物加热至40°C。  Cyclohexane (2407g), butadiene (301.5g) and styrene (82. lg) was charged in the reactor 51 without air and the stirred mixture was heated to 40 ° C. 然后添加TMEDA (0. lg)并且逐滴装入正丁基锂以使杂质反应直到反应混合物的颜色变为淡黄色(滴定）。 Was then added TMEDA (0. lg) was charged and added dropwise to n-butyllithium impurities in the reaction mixture until the reaction color turned yellowish (titration). 在此之后立即装入在环己烷中对应于聚合物的目标分子量的配方量的L4 (1.64mmol，c = 0.084mol/kg)，以开始聚合。 Immediately thereafter in cyclohexane was charged in the formulation corresponding to the amount of target molecular weight of the polymer L4 (1.64mmol, c = 0.084mol / kg), to start polymerization. 将装入引发剂的起始时间用作聚合的起始时间。 The initiator was charged the start time as the start time of the polymerization agent. 同时从装入引发剂开始到最终聚合物温度60°C通过在反应器壁内加热或冷却来增加温度，持续80min，接着第二次添加丁二烯(7.8g)。 While starting from the initiator was charged to a final temperature of 60 ° C the polymer is increased by heating or cooling the reactor wall temperature for 80min, followed by a second addition of butadiene (7.8g). 在5min后，添加链端部改性剂3-甲氧基-3，8，8，9，9-五甲基-2-氧杂-7-硫杂-3，8-二硅杂癸烷(5) (0.62g)。 After 5min, the chain end modifying agent was added 3-methoxy -3,8,8,9,9- pentamethyl-2-oxa-7-thia-sila-3,8-decane (5) (0.62g). 在装入甲醇(0.05g) 20min之后终止反应。 The reaction was terminated after 20min was charged in methanol (0.05g). 用Irganox 1520D (0.97g)稳定聚合物溶液，通过汽提回收聚合物并干燥直到获得〈0.6%含量的残余挥发物。 With Irganox 1520D (0.97g) stable polymer solution, the polymer was recovered by steam stripping and dried until <0.6% residual volatiles content. 在表1中给出样品的完整数据集。 Complete data set are given in Table 1 samples. 将环己烷(4653g)、丁二烯(678.3g)和苯乙烯（185.3g)装入无空气101反应器中并且将搅拌的混合物加热至40°C。  Cyclohexane (4653g), butadiene (678.3g) and styrene (185.3 g of) was charged in the reactor was air-free 101 and the stirred mixture was heated to 40 ° C. 然后添加TMEDA (9.47mmol)并且逐滴装入正丁基锂以使杂质反应直到反应混合物的颜色变为淡黄色(滴定）。 Was then added TMEDA (9.47mmol) was charged and added dropwise to n-butyllithium impurities until the reaction mixture turned a pale yellow color of the reaction (titration). 在此之后立即通过栗装入对应于聚合物的目标分子量的配方量的正丁基锂(4.73mmol)，以开始聚合。 Immediately thereafter loaded by Li corresponds to the target molecular weight of the polymer of formula amount of n-butyllithium (4.73mmol), to start polymerization. 将装入主要量的正丁基锂的起始时间用作聚合的起始时间。 The starting time is loaded into a major amount of n-butyl lithium as the polymerization initiation time. 同时从装入主要量的正丁基锂开始到最终聚合物温度60 °C 通过在反应器壁内加热或冷却来增加温度，持续80min。 Starting charged while a major amount of a polymer of n-butyllithium to a final temperature of 60 ° C to increase the temperature by heating or cooling the reactor walls for 80min. 然后装入丁二烯(3.5g)，接着通过圆筒装入SnCl4 (0.335mmol)和20g环己烷。 Then charged with butadiene (3.5g), was charged followed by SnCl4 (0.335mmol) and 20g of cyclohexane through the barrel. 使反应在10分钟内完成，接着最后一次添加丁二烯（12.6g)。 The reaction was completed within 10 minutes, followed by the last addition of butadiene (12.6g). 在5分钟后添加链端部改性剂3-甲氧基-3，8，8，9，9-五甲基-2-氧杂-7-硫杂-3， 8-二硅杂癸烷(5) (1.21g)并且将反应混合物再搅拌20分钟。 5 minutes after addition of the chain end modifying agent -3,8,8,9,9- pentamethyl-3-methoxy-2-oxa-7-thia -3, decane-1,8-sila (5) (1.21g) and the reaction mixture was stirred for another 20 min. 然后通过装入甲醇(4.73g)来终止反应。 Then the reaction was terminated by charging methanol (4.73g). 用Irganox 1520D (2.2g)稳定聚合物溶液，通过汽提回收聚合物并干燥直到获得〈0.6%含量的残余挥发物。 With (2.2 g) stabilizing the polymer solution Irganox 1520D, the polymer was recovered by steam stripping and dried until <0.6% residual volatiles content. 在表i中给出样品的完整数据集。 Complete data set are given in Table i in the sample. 表1:聚合详情。  Table 1: Details of polymerization. 使用发明性引发剂(L1)制备发明性聚合物A和化合物A。  using the inventive initiator (L1) preparing the polymer A and the compound A. 化合物A表现出所有比较性化合物的最低CML-ML值，该值对应于优异的加工行为。 Compound A exhibited the lowest values ​​of all CML-ML comparative compound, which corresponds to excellent processing behavior. 它还显示最高的聚合物-填料相互作用，如通过Mod300_Mod100 所反映的。 It also showed the highest polymer - filler interaction, as reflected by Mod300_Mod100. 突出的滞后特征通过与具有相同微结构的其他状态的技术聚合物相比最低的mu和tanS60 °C以及最高的在60 °C下的回弹来说明。 Projecting hysteresis characteristic will be described by comparison with other state of the art polymers having the same microstructure mu lowest and highest tanS60 ° C and 60 ° C for rebound of. 冰抓地力(tanS-HTC)和湿抓地力（tanS〇°C)好于比较实施例1和参照实施例C。 Ice grip (tanS-HTC), and wet grip (tanS〇 ° C) Example 1 and better than Comparative Example C. Reference Example 仅参照实施例B示出更好的冰抓地力和湿抓地力。 Example B reference only shows better wet grip and ice grip. 发明性聚合物的磨损特征也是非常有吸引力的。  wear characteristics of the inventive polymers are also very attractive. 其中每个R独立地选自具有1至12个碳原子的任选取代的有机基团，其中R可连接至式1的两个苯环中的一个，以与氨基甲硅烷基的Si原子一起形成一个环； R'为任选取代的亚甲基； 每个R1独立地选自具有1至12个碳原子的任选取代的有机基团； 每个R2独立地选自具有1至12个碳原子的任选取代的有机基团，其中所述R2基团可彼此连接以与Si键合氮原子一起形成一个环； R3和R4各自独立地选自氢、甲基、乙基、丙基、丁基以及乙烯基； 每个R5独立地选自具有1至12个碳原子的任选取代的烃基基团、C1-C6烷氧基X 1-C6烷硫基、以及携带独立地选自C1-C6烷基的两个取代基的胺基和携带独立地选自C1-C 6烷基和苯基的三个取代基的甲硅烷基； a ；b^0；a+b^；10； m=0或I; n = 0 至12; 叉=0、1或2;7=1、2或3;2 = 0、1或24+7+2 = 3;或者1+7+2 = 2，这是在所述氨基甲硅烷基的所述硅原子经由基团R' Wherein each R is independently selected from optionally having 1 to 12 carbon atoms, a substituted organic group, wherein R a may be connected to two benzene rings in formula 1, with the amino group of the silyl group Si atoms together with form a ring; R 'is an optionally substituted methylene group; each R1 is independently selected from optionally having from 1 to 12 carbon atoms, a substituted organic group; each R2 is independently selected from 1 to 12 carbon atoms optionally substituted organic group, wherein the R2 groups may be attached to the nitrogen atom bonded to Si with each other to form a ring; R3 and R4 are each independently selected from hydrogen, methyl, ethyl, propyl , and vinyl butyl; and each R5 is independently selected from optionally having from 1 to 12 carbon atoms, a substituted hydrocarbyl group, C1-C6 alkoxy X 1-C6 alkylthio, and carrying independently selected from amino groups substituted with two C1-C6 alkyl and carrying independently selected C1-C 6 alkyl and phenyl substituted with three silyl group; a; b ^ 0; a + b ^; 10 ; m = 0 or I; n = 0 to 12 is; fork = 0, 1 or 2; 7 = 1, 2 or 3; 0, 1 or 2 = 24 + 7 + 2 = 3; or 1 + 2 + 7 = 2, via which the radicals R in the silane the silicon atom of said carbamoyl group ' 单键两次键合至所述苯环时； 前提是当m=l时，那么n=l至12,并且当m=0时，那么n = 0并且x=l或2; 其中所述氨基甲硅烷基可键合至所述两个苯环中的任一个中，多个氨基甲硅烷基可彼此不同，并且所述R5基团可键合至所述两个苯环中的任一个中。 Two single bond is bonded to the benzene ring; provided that when m = l when then n = l to 12, when m = 0 and when then n = 0 and x = l or 2; wherein said amino silyl groups may be bonded to either one of the two benzene ring, a plurality of amino silyl groups may be different from each other, and the R5 groups may be bonded to any one of the two benzene rings in . 其中每个R独立地选自具有1至12个碳原子的任选取代的有机基团，其中R可连接至式1的两个苯环中的一个，以与氨基甲硅烷基的Si原子一起形成一个环； R'为任选取代的亚甲基； 每个R1独立地选自具有1至12个碳原子的任选取代的有机基团； 每个R2独立地选自具有1至12个碳原子的任选取代的有机基团，其中所述R2基团可彼此连接以与Si键合氮原子一起形成一个环； R3和R4各自独立地选自氢、甲基、乙基、丙基、丁基以及乙烯基； 每个R5独立地选自具有1至12个碳原子的任选取代的烃基基团、C1-C6烷氧基X 1-C6烷硫基、以及携带独立地选自C1-C6烷基的两个取代基的胺基和携带独立地选自C1-C 6烷基和苯基的三个取代基的甲硅烷基； R6选自C1-C6烷基、苯基和苄基； M为选自锂、钠和钾的碱金属； a ；b^0；a+b^；10； m=0或I; n = 0 至12; 叉=0、1或2;7=1、2或3;2 = 0、1或24+7+2 = 3;或 Wherein each R is independently selected from optionally having 1 to 12 carbon atoms, a substituted organic group, wherein R a may be connected to two benzene rings in formula 1, with the amino group of the silyl group Si atoms together with form a ring; R 'is an optionally substituted methylene group; each R1 is independently selected from optionally having from 1 to 12 carbon atoms, a substituted organic group; each R2 is independently selected from 1 to 12 carbon atoms optionally substituted organic group, wherein the R2 groups may be attached to the nitrogen atom bonded to Si with each other to form a ring; R3 and R4 are each independently selected from hydrogen, methyl, ethyl, propyl , and vinyl butyl; and each R5 is independently selected from optionally having from 1 to 12 carbon atoms, a substituted hydrocarbyl group, C1-C6 alkoxy X 1-C6 alkylthio, and carrying independently selected from two substituents of C1-C6 alkyl group and carrying three independently selected C1-C 6 alkyl and phenyl-substituted silyl group; R6 is selected from C1-C6 alkyl, phenyl, and benzyl; m is selected from lithium, sodium and potassium alkali metal; a; b ^ 0; a + b ^; 10; m = 0 or I; n = 0 to 12 is; fork = 0, 1 or 2; 7 = 1, 2 or 3; 0, 1 or 2 = 24 + 7 + 2 = 3; or 者1+7+2 = 2，这是在所述氨基甲硅烷基的所述硅原子经由基团R'或单键两次键合至所述苯环时； 前提是当m=l时，那么n=l至12,并且当m=0时，那么n = 0并且x=l或2; 其中所述氨基甲硅烷基可键合至所述两个苯环中的任一个中，多个氨基甲硅烷基可彼此不同，并且所述R5基团可键合至所述两个苯环中的任一个中。 By 7 + 1 + 2 = 2, which is the silicon atom of said amino group bonded via a silyl group R 'or a single bond when two bonds to the benzene ring; provided that when m = l, then n = l to 12, when m = 0 and when then n = 0 and x = l or 2; wherein said amino group may be a silyl group bonded to either one of the two benzene ring, a plurality of amino silyl group may be different from each other, and the R5 groups may be bonded to any one of the two benzene rings. 与（ii)至少一种以下式3化合物反应R6M 式3 其中式1为如权利要求1所述的并且R6和M为权利要求2所述的。 Reaction formula R6M and (ii) at least one compound of formula 33 wherein Formula 1 is as claimed in claim 1 and R6 and M are as claimed in claim 2. 4. 如权利要求1所述的化合物、如权利要求2所述的聚合引发剂或如权利要求3所述的方法，其中每个R独立地选自C1-C 12脂族基团和(：3-(：12芳族基团，每个基团可任选地为取代的，优选独立地选自C 1-C6烷基、C2-C6烯基、C7-C iq烷基芳基和C6-Ciq芳基，更优选独立地选自C1-C4烷基、C7烷基芳基和C6芳基。 4. The compound according to claim 1, said polymerization initiator as claimed in claim 2 or method of claim 3, wherein each R is independently selected from C1-C 12 aliphatic groups and (: 3 - (: 12 aromatic radicals, each radical may optionally be substituted, preferably independently selected from C 1-C6 alkyl, C2-C6 alkenyl, C7-C iq and C6 alkylaryl -Ciq aryl group, more preferably independently selected from C1-C4 alkyl, C7 C6 alkylaryl and aryl groups. 5. 如权利要求4所述的化合物、聚合引发剂或方法，其中所述C1-C1^族基团为直链、支链或环状的并且可为饱和或饱和的，优选选自甲基、乙基、正丙基、正丁基、正戊基、正己基、 正庚基、正辛基、正壬基、正癸基、正十一烷基和正十二烷基、乙烯基、丙烯基和丁烯基、间丙基、叔丁基、仲丁基、异戊基、新戊基和异己基、异丙烯基和异戊二烯基、环丙基、环丁基、环戊基、环己基、环庚基和环辛基、环戊烯基、环己烯基以及环庚烯基。 5. A compound as claimed in claim 4 preferably selected from methyl claim agent or polymerization initiator, wherein the C1-C1 ^ aliphatic group is a straight chain, branched chain or cyclic and may be saturated or unsaturated, , ethyl, n-propyl, n-butyl, n-pentyl, n-hexyl, n-heptyl, n-octyl, n-nonyl, n-decyl, n-undecyl and n-dodecyl, ethenyl, propenyl, and butenyl, among propyl, t-butyl, sec-butyl, isopentyl, neopentyl, and isohexyl group, isopropenyl group and isoprene, cyclopropyl, cyclobutyl, cyclopentyl , cyclohexyl, cycloheptyl and cyclooctyl, cyclopentenyl, cyclohexenyl and cycloheptenyl. 6. 如权利要求4所述的化合物、聚合引发剂或方法，其中所述C3-C12芳族基团为同素环芳族基团或杂环芳族基团，优选地选自苯基、萘基、噻唑基、异噻唑基、噁唑基、异噁唑基、呋喃基、苯硫基、吡嗪基、哒嗪基、嘧啶基、N-C1-C7-烷基化或N-三(C1-C 7烃基）甲硅烷基保护的吡咯基、吡啶基、苯并噁唑基、苯并噻唑基、苯并呋喃基、噌啉基、酞嗪基、喹喔啉基、NC 1-C7-烷基化或N-三(C1-C7烃基）甲硅烷基保护的吲哚基、喹啉基、异喹啉基以及吩嗪基。 6. The compound according to claim 4, or a polymerization initiator, wherein the C3-C12 aromatic radical is a homocyclic aromatic group or heterocyclic aromatic group, preferably selected from phenyl, naphthyl, thiazolyl, isothiazolyl, oxazolyl, isoxazolyl, furanyl, thiophenyl, pyrazinyl, pyridazinyl, pyrimidinyl, N-C1-C7- alkyl or N- tris (C1-C 7 hydrocarbon) silyl protecting pyrrolyl, pyridyl, benzoxazolyl, benzothiazolyl, benzofuranyl, cinnolinyl, phthalazinyl, quinoxalinyl, NC 1- three C7- alkyl or N- (C1-C7 hydrocarbon) silyl protected methyl indolyl, quinolinyl, isoquinolinyl, and phenazine group. 7. 如权利要求1至6中任一项所述的化合物、聚合引发剂或方法，其中每个R1独立地选自C1-C12脂族基团和C3-C12芳族基团，每个基团可任选地为取代的，优选独立地选自C 1-C10烷基、C7-C1Q烷基芳基和C 6-C1Q芳基，更优选独立地选自C1-C6烷基和C 6-C1Q芳基。 7. A compound as claimed in any one of claims 6 to the requirements of each base, or a polymerization initiator, wherein each R1 is independently selected from C1-C12 aliphatic group and a C3-C12 aromatic radical, groups may optionally be substituted, preferably independently selected from C 1-C10 alkyl, C7-C1Q alkyl aryl and C 6-C1Q aryl group, more preferably independently selected from C1-C6 alkyl and C 6 -C1Q aryl group. 8. 如权利要求7所述的化合物、聚合引发剂或方法，其中所述C1-Cli^族基团为直链、支链或环状的并且可为饱和或饱和的，优选选自甲基、乙基、正丙基、正丁基、正戊基、正己基、 正庚基、正辛基、正壬基、正癸基、正十一烷基和正十二烷基、乙烯基、丙烯基和丁烯基、间丙基、叔丁基、仲丁基、异戊基、新戊基和异己基、异丙烯基和异戊二烯基、环丙基、环丁基、环戊基、环己基、环庚基和环辛基、环戊烯基、环己烯基以及环庚烯基。 8. The compound according to claim 7, or a polymerization initiator, wherein said C1-Cli ^ aliphatic group is a straight chain, branched chain or cyclic and may be saturated or unsaturated, preferably selected from methyl , ethyl, n-propyl, n-butyl, n-pentyl, n-hexyl, n-heptyl, n-octyl, n-nonyl, n-decyl, n-undecyl and n-dodecyl, ethenyl, propenyl, and butenyl, among propyl, t-butyl, sec-butyl, isopentyl, neopentyl, and isohexyl group, isopropenyl group and isoprene, cyclopropyl, cyclobutyl, cyclopentyl , cyclohexyl, cycloheptyl and cyclooctyl, cyclopentenyl, cyclohexenyl and cycloheptenyl. 9. 如权利要求7所述的化合物、聚合引发剂或方法，其中所述C3-C12芳族基团为同素环芳族基团或杂环芳族基团，优选地选自苯基、萘基、噻唑基、异噻唑基、噁唑基、异噁唑基、呋喃基、苯硫基、吡嗪基、哒嗪基、嘧啶基、NC 1-C7-烷基化或N-三(C1-C7烃基）甲硅烷基保护的吡咯基、吡啶基、苯并噁唑基、苯并噻唑基、苯并呋喃基、噌啉基、酞嗪基、喹喔啉基、NC 1-C7-烷基化或N-三(C1-C7烃基）甲硅烷基保护的吲哚基、喹啉基、异喹啉基以及吩嗪基。 9. The compound according to claim 7, or a polymerization initiator, wherein the C3-C12 aromatic radical is a homocyclic aromatic group or heterocyclic aromatic group, preferably selected from phenyl, naphthyl, thiazolyl, isothiazolyl, oxazolyl, isoxazolyl, furanyl, thiophenyl, pyrazinyl, pyridazinyl, pyrimidinyl, NC 1-C7- alkyl or N- tris ( C1-C7 hydrocarbon) silyl protecting pyrrolyl, pyridyl, benzoxazolyl, benzothiazolyl, benzofuranyl, cinnolinyl, phthalazinyl, quinoxalinyl, NC 1-C7- three alkylated or N- (C1-C7 hydrocarbon) silyl-protected indolyl, quinolinyl, isoquinolinyl, and phenazine group. 10. 如权利要求1至9中任一项所述的化合物、聚合引发剂或方法，其中每个R2独立地选自&-& 2脂族基团和C3-C12芳族基团，每个基团可任选地为取代的并且其中所述R 2基团可彼此连接以与所述Si键合氮原子一起形成一个环，优选独立地选自Ci-Ciq烷基、C7-C1Q烷基芳基和C 6-Ciq芳基，更优选独立地选自C1-C8烷基和C 7-C8烷基芳基。 10. A compound according to any one of claim 9 claim agent or polymerization initiator, wherein each R2 is independently selected & - & 2 aliphatic groups, and C3-C12 aromatic radical, each of groups may optionally be substituted and wherein the R 2 groups may be connected to each other with the Si atom bonded to the nitrogen together form a ring, preferably independently selected from Ci-Ciq alkyl, C7-C1Q alkyl aryl and C 6-Ciq aryl group, more preferably independently selected from C1-C8 alkyl and C 7-C8 alkylaryl group. 11. 如权利要求10所述的化合物、聚合引发剂或方法，其中所述C1-C12脂族基团为直链、 支链或环状的并且可为饱和或饱和的，优选选自甲基、乙基、正丙基、正丁基、正戊基、正己基、正庚基、正辛基、正壬基、正癸基、正十一烷基和正十二烷基、乙烯基、丙烯基和丁烯基、 间丙基、叔丁基、仲丁基、异戊基、新戊基和异己基、异丙烯基和异戊二烯基、环丙基、环丁基、环戊基、环己基、环庚基和环辛基、环戊烯基、环己烯基以及环庚烯基。 And may be saturated or unsaturated 11. The compound of claim 10 straight chain, branched chain or cyclic claim, or a polymerization initiator, wherein the C1-C12 aliphatic groups, preferably selected from methyl , ethyl, n-propyl, n-butyl, n-pentyl, n-hexyl, n-heptyl, n-octyl, n-nonyl, n-decyl, n-undecyl and n-dodecyl, ethenyl, propenyl, and butenyl, among propyl, t-butyl, sec-butyl, isopentyl, neopentyl, and isohexyl group, isopropenyl group and isoprene, cyclopropyl, cyclobutyl, cyclopentyl , cyclohexyl, cycloheptyl and cyclooctyl, cyclopentenyl, cyclohexenyl and cycloheptenyl. 12. 如权利要求10所述的化合物、聚合引发剂或方法，其中所述(：3-(：12芳族基团为同素环芳族基团或杂环芳族基团，优选地选自苯基、萘基、噻唑基、异噻唑基、噁唑基、异噁唑基、 呋喃基、苯硫基、吡嗪基、哒嗪基、嘧啶基、NC 1-C7-烷基化或N-三(C1-C7烃基）甲硅烷基保护的吡咯基、吡啶基、苯并噁唑基、苯并噻唑基、苯并呋喃基、噌啉基、酞嗪基、喹喔啉基、NC 1-C7-烷基化或N-三(C1-C7烃基）甲硅烷基保护的吲哚基、喹啉基、异喹啉基以及吩嗪基。 12. The compound according to claim 10, or a polymerization initiator, wherein the (: 3 - (: 12 aromatic homocyclic group is an aromatic group or a heterocyclic aromatic group, preferably selected from from phenyl, naphthyl, thiazolyl, isothiazolyl, oxazolyl, isoxazolyl, furanyl, thiophenyl, pyrazinyl, pyridazinyl, pyrimidinyl, NC 1-C7- alkyl or N- tris (C1-C7 hydrocarbon) silyl protecting pyrrolyl, pyridyl, benzoxazolyl, benzothiazolyl, benzofuranyl, cinnolinyl, phthalazinyl, quinoxalinyl, NC 1-C7- alkyl or N- tris (C1-C7 hydrocarbon) silyl protected methyl indolyl, quinolinyl, isoquinolinyl, and phenazine group. 13. 如权利要求1至12中任一项所述的化合物、聚合引发剂或方法，其中每个R5独立地选自C1-C 12脂族基团和C3-C12芳族基团，每个基团可任选地为取代的，优选独立地选自直链或支链C 1-C5烷基、C7-C12烷基芳基和C6-C 12芳基，更优选独立地选自C1-C5烷基、C7烷基芳基和C 6 芳基，甚至更优选选自C1-C5烷基。 13. 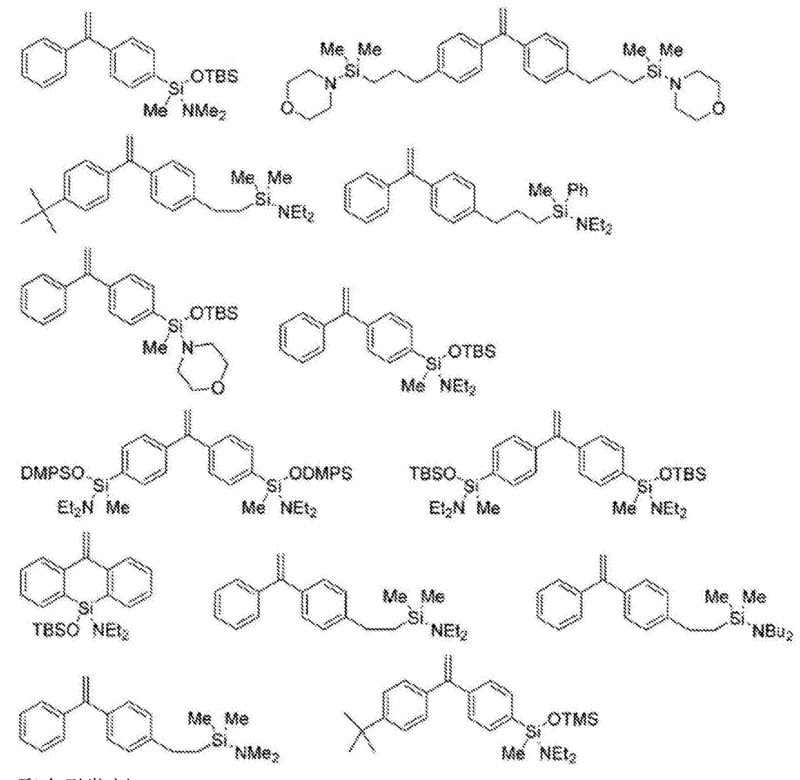 A compound according to any one of 12 claims agent or a polymerization initiator, wherein each R5 is independently selected from C1-C 12 aliphatic group and a C3-C12 aromatic radical, each of groups may optionally be substituted, preferably independently selected from linear or branched C 1-C5 alkyl, C7-C12 alkylaryl group and a C6-C 12 aryl group, more preferably independently selected from C1- C5 alkyl, C7 alkylaryl, and C 6 aryl group, and even more preferably selected from C1-C5 alkyl. 14. 如权利要求13所述的化合物、聚合引发剂或方法，其中所述C1-C12脂族基团为直链、 支链或环状的并且可为饱和或饱和的，优选选自甲基、乙基、正丙基、正丁基、正戊基、正己基、正庚基、正辛基、正壬基、正癸基、正十一烷基和正十二烷基、乙烯基、丙烯基和丁烯基、 间丙基、叔丁基、仲丁基、异戊基、新戊基和异己基、异丙烯基和异戊二烯基、环丙基、环丁基、环戊基、环己基、环庚基和环辛基、环戊烯基、环己烯基以及环庚烯基。 And may be saturated or unsaturated 14. The compound of claim 13 straight chain, branched chain or cyclic claim, or a polymerization initiator, wherein the C1-C12 aliphatic groups, preferably selected from methyl , ethyl, n-propyl, n-butyl, n-pentyl, n-hexyl, n-heptyl, n-octyl, n-nonyl, n-decyl, n-undecyl and n-dodecyl, ethenyl, propenyl, and butenyl, among propyl, t-butyl, sec-butyl, isopentyl, neopentyl, and isohexyl group, isopropenyl group and isoprene, cyclopropyl, cyclobutyl, cyclopentyl , cyclohexyl, cycloheptyl and cyclooctyl, cyclopentenyl, cyclohexenyl and cycloheptenyl. 15. 如权利要求13所述的化合物、聚合引发剂或方法，其中所述(：3-(：12芳族基团为同素环芳族基团或杂环芳族基团，优选地选自苯基、萘基、噻唑基、异噻唑基、噁唑基、异噁唑基、 呋喃基、苯硫基、吡嗪基、哒嗪基、嘧啶基、NC 1-C7-烷基化或N-三(C1-C7烃基）甲硅烷基保护的吡咯基、吡啶基、苯并噁唑基、苯并噻唑基、苯并呋喃基、噌啉基、酞嗪基、喹喔啉基、NC 1-C7-烷基化或N-三(C1-C7烃基）甲硅烷基保护的吲哚基、喹啉基、异喹啉基以及吩嗪基。 15. The compound according to claim 13, or a polymerization initiator, wherein the (: 3 - (: 12 aromatic homocyclic group is an aromatic group or a heterocyclic aromatic group, preferably selected from from phenyl, naphthyl, thiazolyl, isothiazolyl, oxazolyl, isoxazolyl, furanyl, thiophenyl, pyrazinyl, pyridazinyl, pyrimidinyl, NC 1-C7- alkyl or N- tris (C1-C7 hydrocarbon) silyl protecting pyrrolyl, pyridyl, benzoxazolyl, benzothiazolyl, benzofuranyl, cinnolinyl, phthalazinyl, quinoxalinyl, NC 1-C7- alkyl or N- tris (C1-C7 hydrocarbon) silyl protected methyl indolyl, quinolinyl, isoquinolinyl, and phenazine group. 16. 如权利要求1至15中任一项所述的化合物、聚合引发剂或方法，其中所述任选的取代基独立地选自C1-C 12烷基、C6-C12芳基、C4-C12杂芳基、C 1-C6烷氧基、C1-C6烷硫基、二(C1-C 6 烷基)氨基、二苯基氨基、二（C1-C6烷基)膦基、二苯基磷基、〇5-&2芳氧基、C 6-C12芳硫基、三(C1-C6烷基）甲硅烷基、三(C 6-C12芳基）甲硅烷基以及三(混合Sc1-C6烷基和C 6-C12芳基）甲娃烷基。 16. A compound according to any one of 15 claims, a polymerization initiator or a method, wherein the optional substituents are independently selected from C1-C 12 alkyl, C6-C12 aryl group, C4- C12 heteroaryl group, C 1-C6 alkoxy, C1-C6 alkylthio, di (C1-C 6 alkyl) amino, diphenylamino, di (C1-C6 alkyl) phosphino, diphenyl phosphorus group, an aryloxy group 〇5- & 2, C 6-C12 aryl group, tri (C1-C6 alkyl) silyl, tri (C 6-C12 aryl) silyl groups and tris (mixed Sc1-C6 alkyl and C 6-C12 aryl) methyl group baby. 17. 如权利要求1至16中任一项所述的化合物、聚合引发剂或方法，其中R3和R4各自独立地选自氢、甲基和乙烯基并且更优选地二者均为氢。 17. A compound according to any one of 16 claims agent or polymerization initiator, wherein R3 and R4 are each independently selected from hydrogen, methyl and vinyl and more preferably both are hydrogen. 18. 如权利要求2至17中任一项所述的聚合引发剂或方法，其中R6选自甲基、正丁基、仲丁基、叔丁基、苄基以及苯基，优选为正丁基。 18. The polymerization of claims 2 to 17 or method of any of claims initiator, wherein R6 is selected from methyl, n-butyl, sec-butyl, tert-butyl, benzyl and phenyl, preferably n-butyl base. 19. 如权利要求2至18中任一项所述的聚合引发剂或方法，其中M为锂。 19. The polymerization 2 to 18 in any one of claims initiator agent or method, wherein M is lithium. 20. 如权利要求2所述的聚合引发剂或如权利要求3所述的方法，其中每个R独立地选自C1-C5烷基和C6芳基，每个R1独立地选自C 1-C4烷基和C6芳基，每个R2独立地选自C1-C 8烷基和C7-Ciq烷基芳基，R3和R4各自为氢，每个R 5独立地选自C1-C4烷基，R6选自甲基、乙基、叔丁基、 正丁基、仲丁基、苯基以及苄基，M为锂，a=l或2，b = 0或I，m = 0并且R'为亚甲基，并且n=l、 2或3，x = 0或l，y = l或2并且z = 0或1。 20. A polymerization initiator according to claim 2 or method of claim 3, wherein each R is independently selected from C1-C5 alkyl and C6 aryl group, each R1 is independently selected from C 1- C4 alkyl and C6 aryl group, each R2 is independently selected from C1-C 8 alkyl, and C7-Ciq alkylaryl, R3 and R4 are each hydrogen, each R 5 is independently selected from C1-C4 alkyl , R6 is selected from methyl, ethyl, t-butyl, n-butyl, sec-butyl, phenyl and a benzyl group, m is lithium, a = l or 2, b = 0 or I, m = 0 and R ' a methylene group, and n = l, 2, or 3, x = 0 or l, y = l or 2 and z = 0 or 1. 21. -种为以下的反应产物的聚合物i) 如权利要求2至20中任一项所述的式2聚合引发剂与ii) 一种或多种选自共辄二稀的可聚合物单体和任选地一种或多种选自芳族乙烯基化合物的可聚合单体，或者i'）除如权利要求2所述的式2聚合引发剂之外的聚合引发剂， ii '）一种或多种选自共辄二稀的可聚合物单体和任选地一种或多种选自芳族乙烯基化合物的可聚合单体，以及iii'）用作主链改性剂和/或链端部改性剂的如权利要求1和4至17中任一项所述的式1 化合物。 Polymer species may be the reaction product of the polymer i) Formula 2-1 as claimed in any one of a polymerization initiator and 202 ii) one or more selected co-diene-Noir requirements - 21 monomers and optionally one or more compounds selected from aromatic vinyl monomers may be polymerizable, or i ') of the other of formula 2 as claimed in claim 2 a polymerization initiator other than the polymerization initiator agents, ii' ) one or more selected co-polymer may be diluted noir two monomers and optionally one or more compounds selected from aromatic vinyl polymerizable monomer, and iii ') used as a backbone modified compound 11 and 4 to 17 according to any one of the formula and / or chain-end modifying agent as claimed in claim. 22. -种制备聚合物的方法，其包括使以下反应的步骤i) 如权利要求2至20中任一项所述的式2聚合引发剂与ii) 一种或多种选自共辄二稀的可聚合物单体和任选地一种或多种选自芳族乙烯基化合物的可聚合单体，或者i'）除如权利要求2所述的式2聚合引发剂之外的聚合引发剂， ii '）一种或多种选自共辄二稀的可聚合物单体和任选地一种或多种选自芳族乙烯基化合物的可聚合单体，以及iii'）用作主链改性剂和/或链端部改性剂的如权利要求1和4至17中任一项所述的式1 化合物。 22. - The method of preparing a polymer of the kind, which comprises the following reaction steps i) as claimed in any one of Formulas 2 to 20 in any one of claims 2 and a polymerization initiator ii) one or more compounds selected from two co-Noir the polymer can dilute the monomers, and optionally one or more compounds selected from aromatic vinyl monomers may be polymerizable, or i ') a polymerization other than formula 2 of the polymerization initiator as claimed in claim 2, initiator, ii ') one or more selected co-polymer may be diluted noir two monomers and optionally one or more compounds selected from aromatic vinyl polymerizable monomer, and iii') with modifying a main chain and / or chain-end modifier compound 11 and 4 to 17 according to any one of claims formula. 23. -种聚合物组合物，其包含如权利要求21所述的聚合物和一种或多种选自以下的另外的组分：（i)添加到用于制备所述聚合物的聚合过程中或者因所述聚合过程而形成的组分，以及（ii)在从所述聚合过程去除溶剂之后保留的组分。 23. - seed polymer composition comprising a polymer as claimed in claim 21 and one or more additional components selected from: (i) added to the polymerization process for the preparation of the polymer or due to the component formed by the polymerization process, and (ii) the solvent component after removal from the polymerization process reserved. 24. 如权利要求23所述的聚合物组合物，其包含一种或多种增量油。 The polymer composition of claim 23 as claimed in claim 24, which comprises one or more of extender oil. 25. 如权利要求23或24所述的聚合物组合物，其还包含一种或多种填料。 The polymer composition of claim 23 or claim 25. 24, further comprising one or more fillers. 26. 如权利要求23至25中任一项所述的聚合物组合物，其还包含至少一种硫化剂。 23 to the polymer composition according to any one of claims 25 to claim 26., further comprising at least one vulcanizing agent. 27. -种硫化聚合物组合物，其通过将如权利要求26所述的聚合物组合物硫化来获得。 27. - Species vulcanized polymer composition, which is obtained by vulcanizing the polymer composition according to claim 26. 28. -种制备硫化聚合物组合物的方法，其包括将如权利要求26所述的聚合物组合物硫化的步骤。 28. - The method of preparing vulcanized polymer species composition, which comprises a polymer composition as claimed in claim 26 the step of curing requirements. 29. -种制品，其包含由如权利要求27所述的硫化聚合物组合物形成的至少一种组分。 29. - kind of article, comprising at least one component formed from a vulcanized polymer composition according to claim 27.